September! The year begins winding down. Winter is coming, and yet for many of us, Fall is a time of new beginnings. I guess it hearkens back to my school days and the start of the new school year. For me, September almost always seems more like the beginning of the new year than the first of January does. This year, with the advent of September, I decided to set off on a new adventure with my business -- I've decided to start offering some of my patterns for sale on Ravelry. Based on the free patterns that I've posted on this blog, I knew that writing up patterns was time-consuming, but I discovered that creating a pattern for sale as a digital download takes even longer. I attribute a lot of the time spent to just technically figuring out what I needed to do, so I am hoping (fingers very crossed) that the process will become quicker and easier. 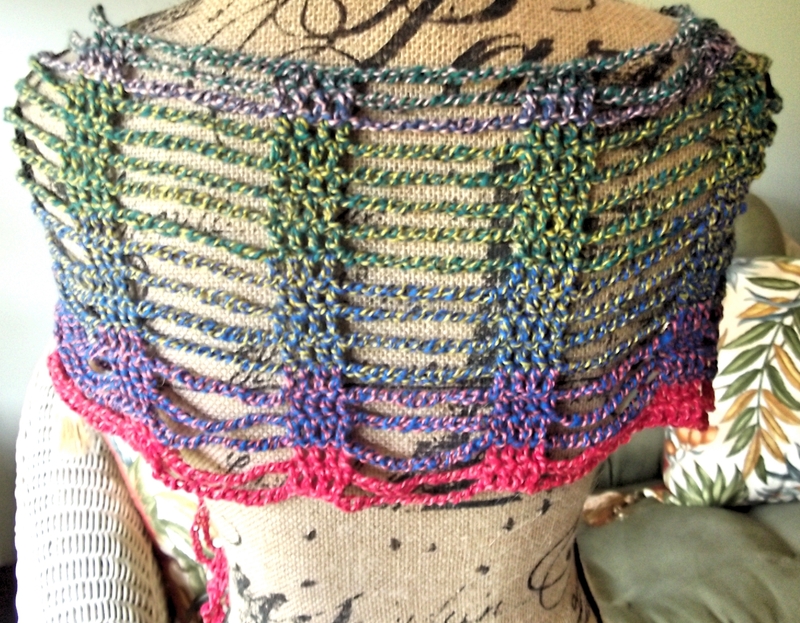 Yesterday, I posted my first pattern in my new, online pattern shop. 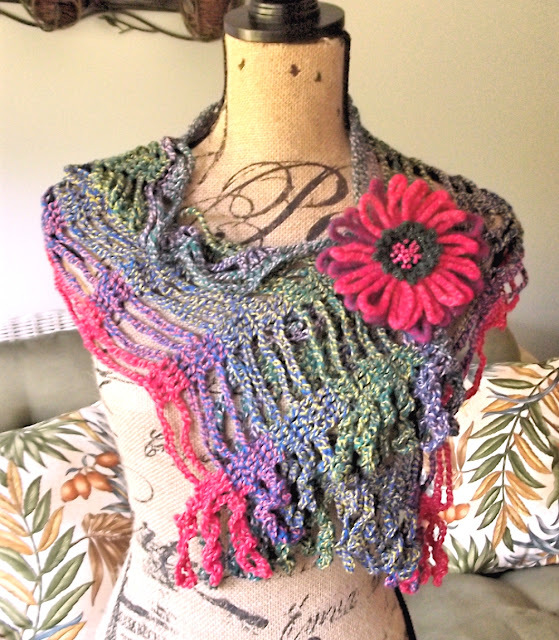 Actually, it's a double pattern that includes directions for two pieces: The Sticks and Stones Ponchette/Capelet (I could not decide which term was best) and the Sticks and Stones Cowl. 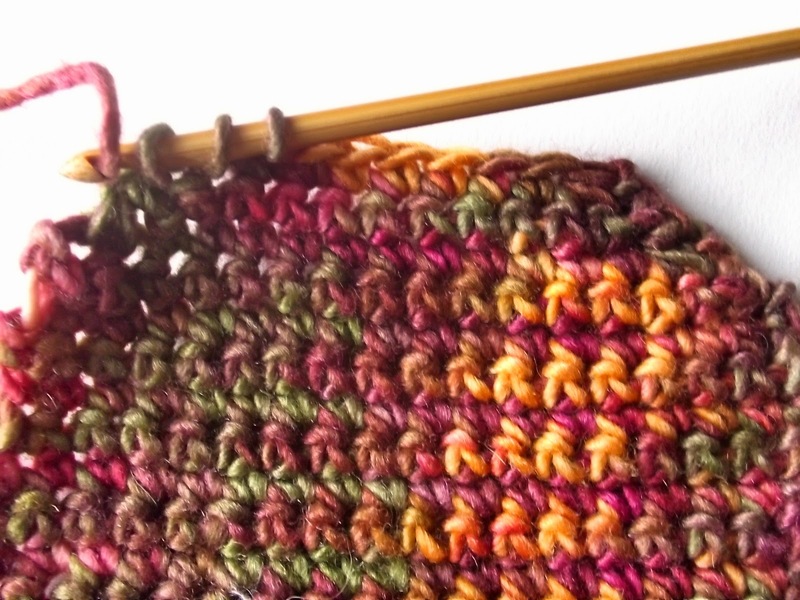 The name “Sticks and Stones” refers to the appearance of the stitch pattern of alternating single treble stitches (sticks) and treble bobbles (stones). 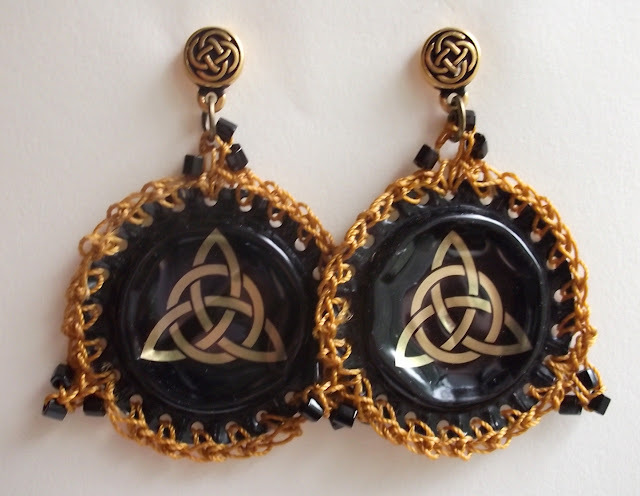 Both are very versatile pieces and quick to make. 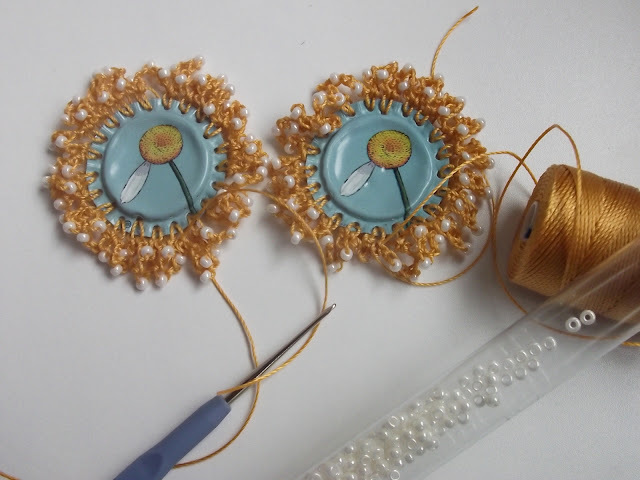 The ponchette/capelet comes with instructions for a crocheted flower brooch/clip that can be worn on the ponchette, or used as a hair accessory, clipped to a bag, or pinned to a coat or sweater as a brooch. 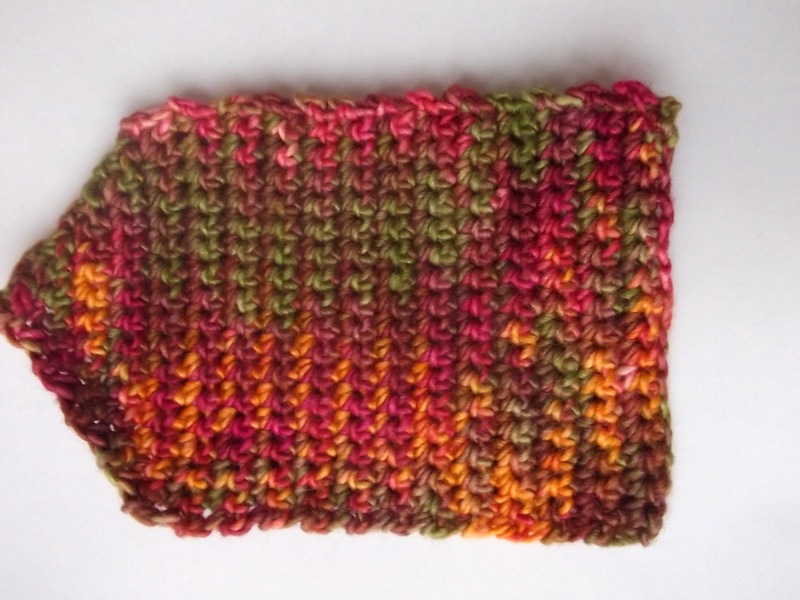 I even provided directions for ideas on how to create variations on the standard pattern, such as the one pictured below. 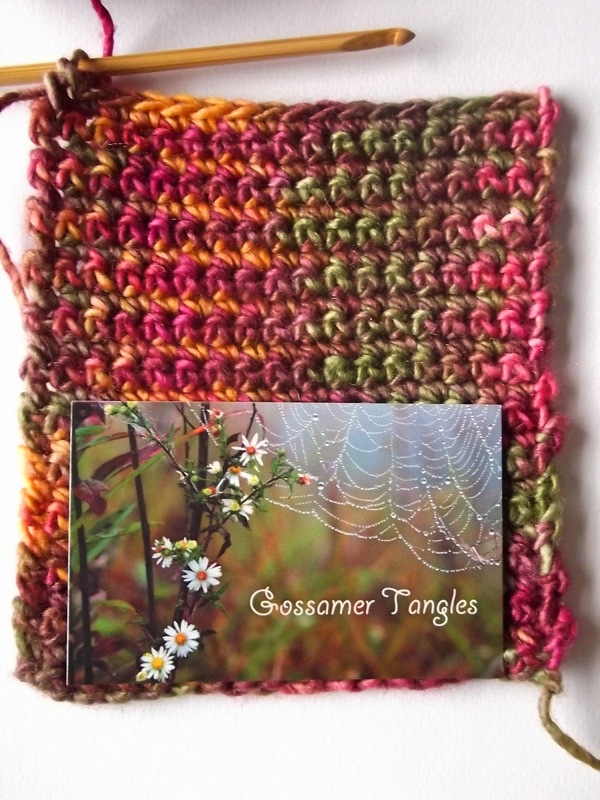 Not to worry, I do intend to continue to offer occasional free patterns and tutorials here on my blog. I've created a specific page that has the links for all the free patterns and instructions so you don't have to spend time searching for them. I hope it's useful. Pure Michigan. 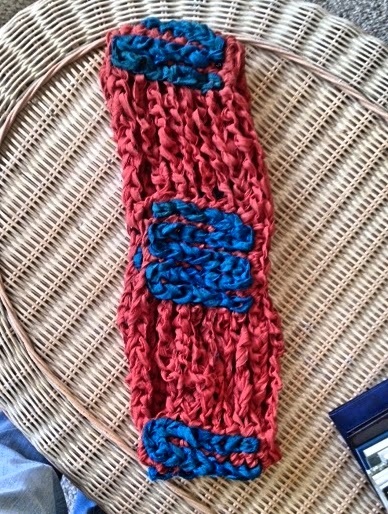 That label truly applies to these new scarves I've crocheted. 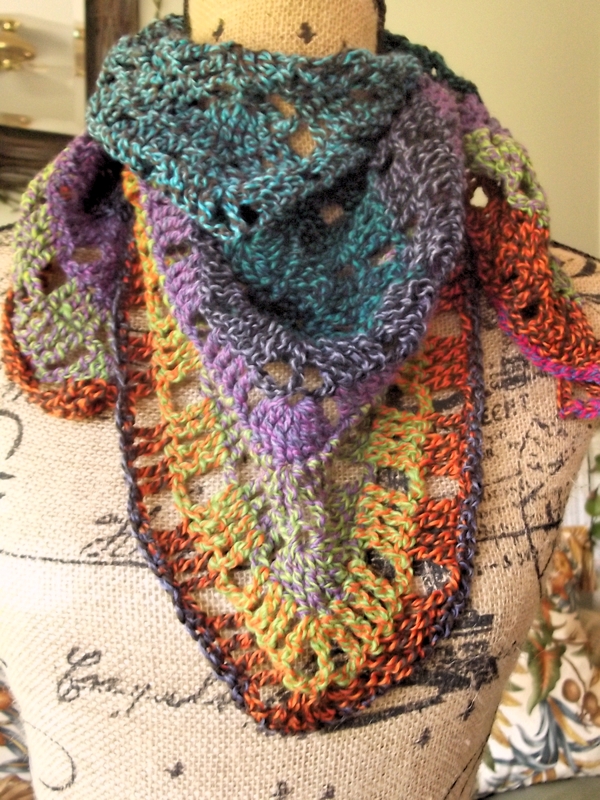 The yarn I used in each project is "Crazy Yarn", 100% merino wool from Stonehedge, a 157-year-old working farm and fiber mill in East Jordan, Michigan. So, the yarn is both "raised" and processed right here in Michigan! 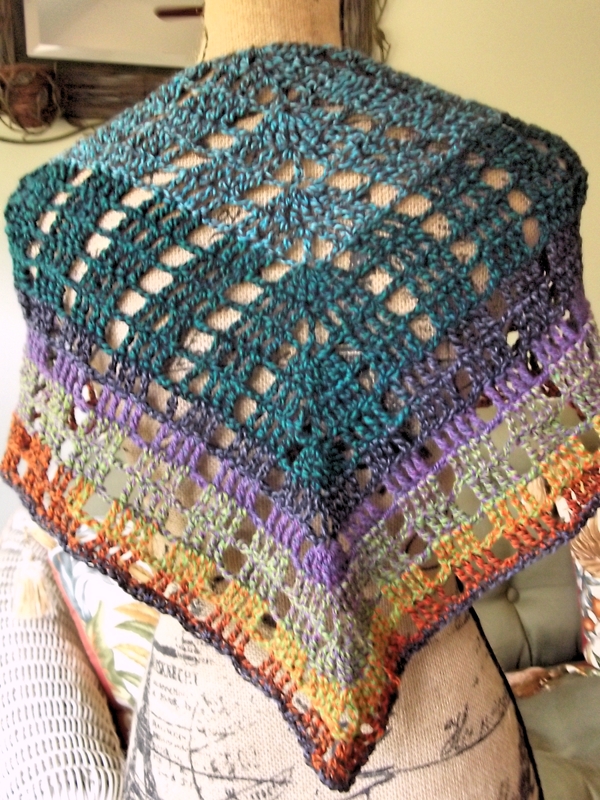 I fell in LOVE with this yarn! It is so soft, and I love the vibrant colors running through every skein in double-stranded twirls. Each individual skein of this yarn is unique, so it is perfect for one-skein projects, like these scarves, or shawlettes. 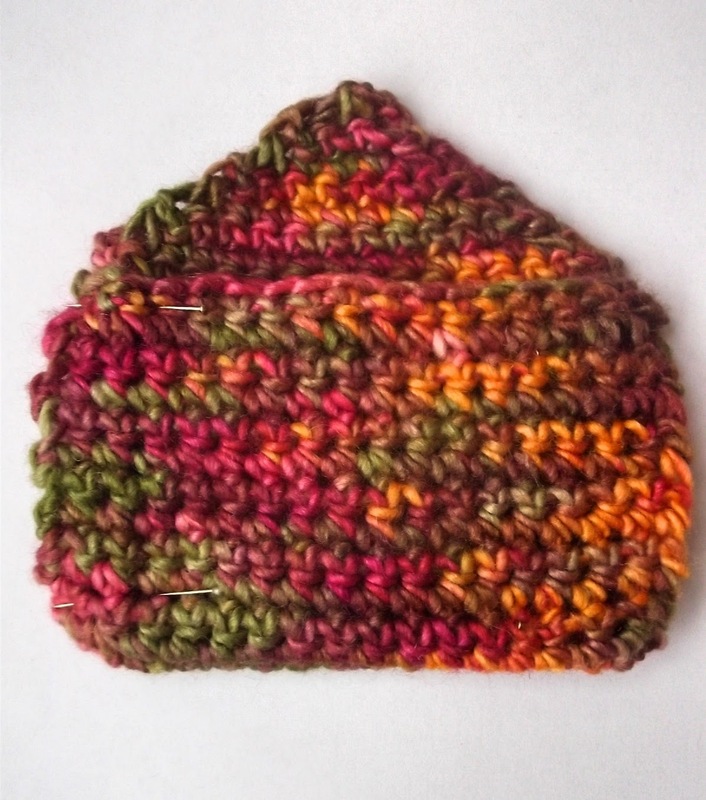 There are about 230 yards in each skein and it is a DK weight. If you have a bigger project, however, it's not a problem. 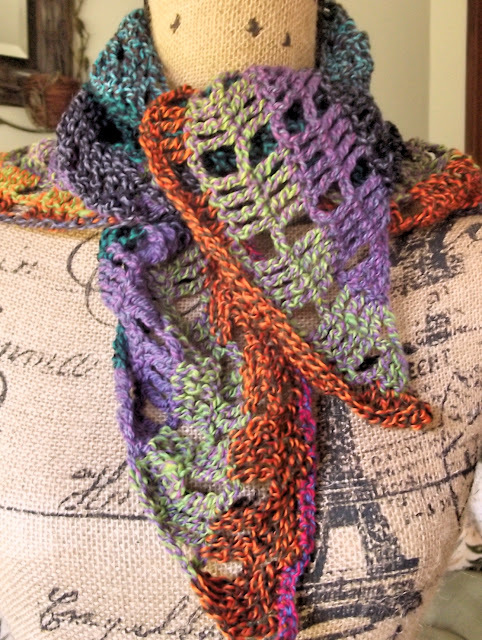 You can just choose multiple skeins with complimentary colors and keep "striping on" more shades! 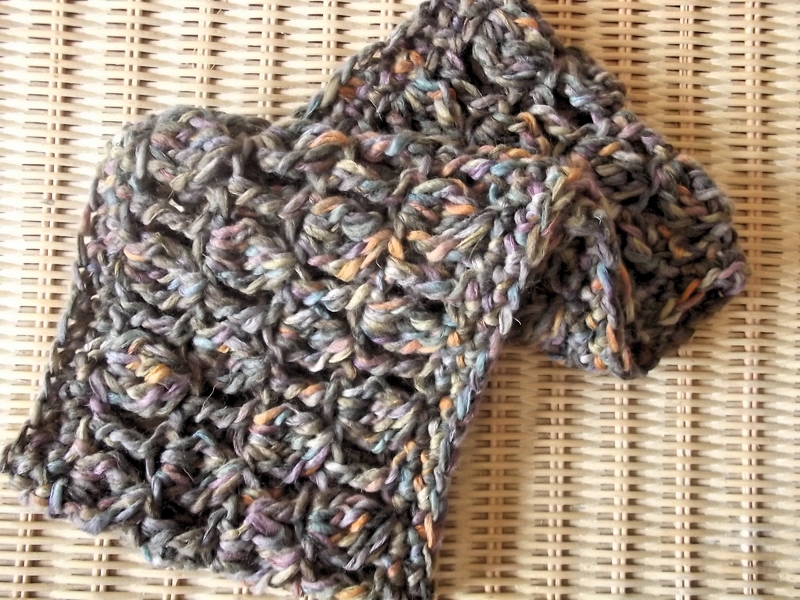 The first project that I crocheted with this yarn is a triangular scarf/shawlette. 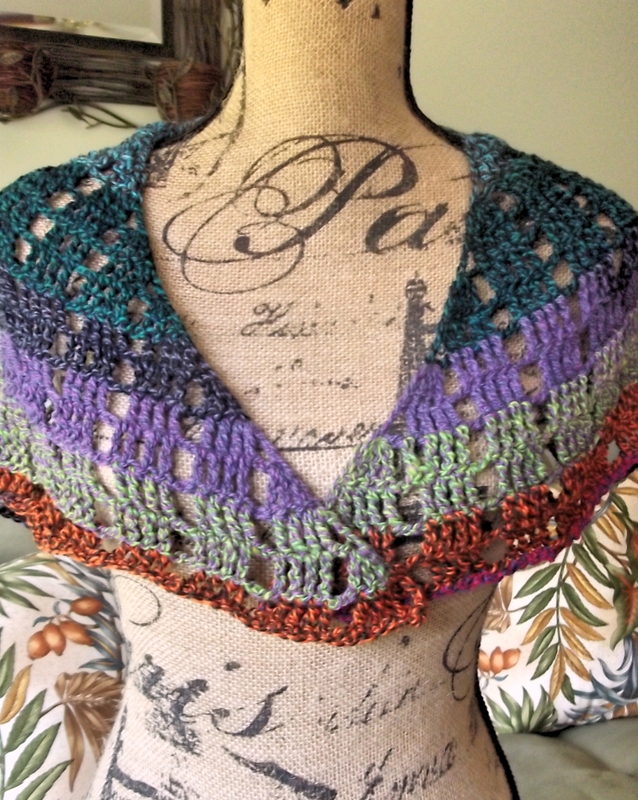 It is a free pattern (Sunspree One Skein Shawl) from Caron yarns that I found on the Yarnspirations website. It's an easy design to make, and it can be worn in a number of different ways, as you can see in the photos below. 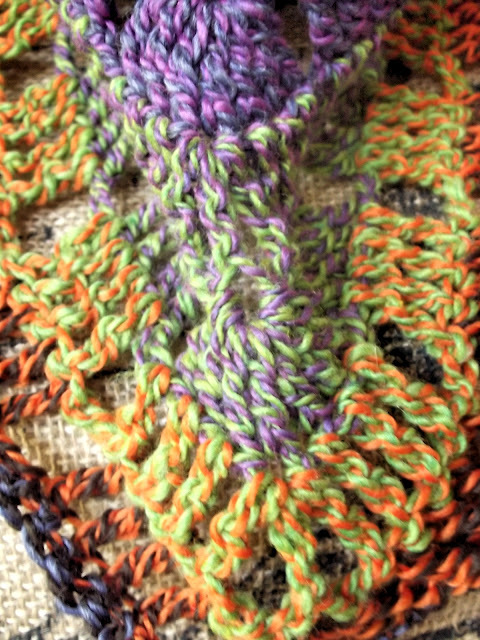 For my second project with Stonhedge Fiber Mill's Crazy Yarn, I got a little more adventurous. This scarf/shawlette is my own design. I added a flower shawl clip/pin (has both types of fastenings) to give it a bit of distinction and allow for more wearing options. The flower is felted, and incorporates beads, wire, and some additional yarn. 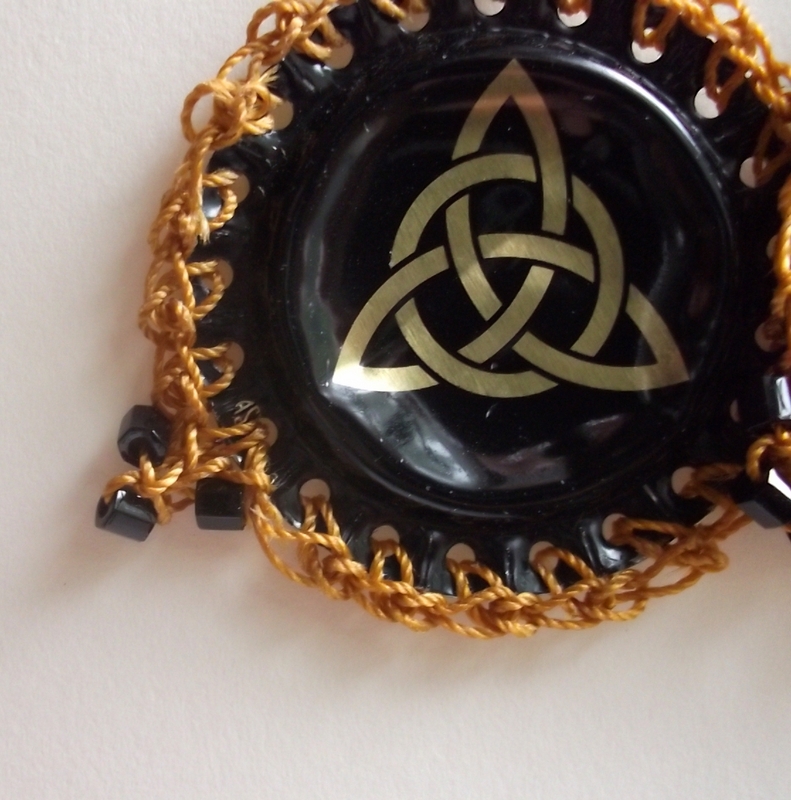 It can be used as a brooch or clip on it's own, too. 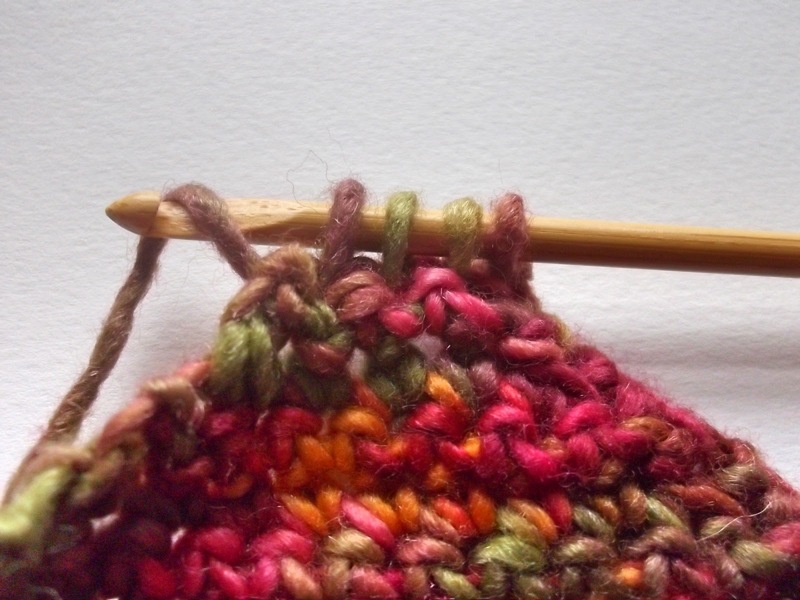 This yarn is a little tricky to find. 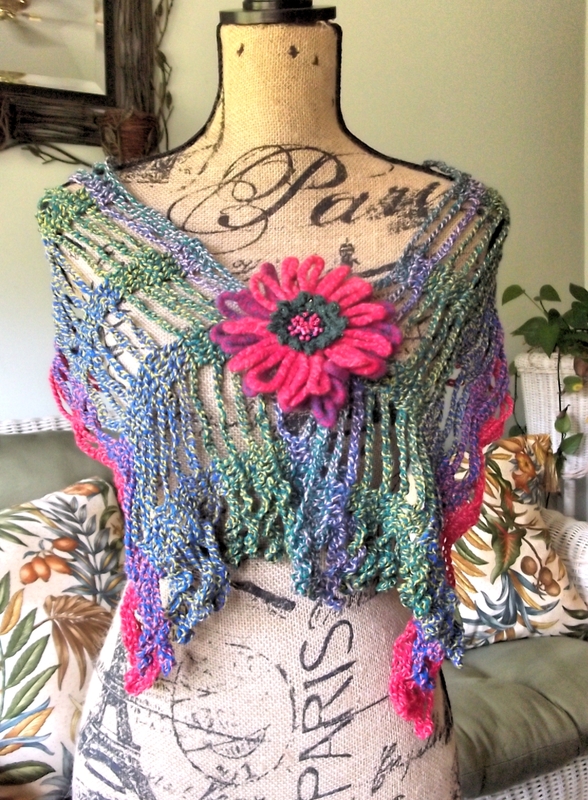 On the fiber mill website, there is a list of local yarn shops, scattered throughout the country, that stock Stonehedge yarns. At least in my area, whether those shops actually have the "Crazy Yarn" seems to be hit or miss. 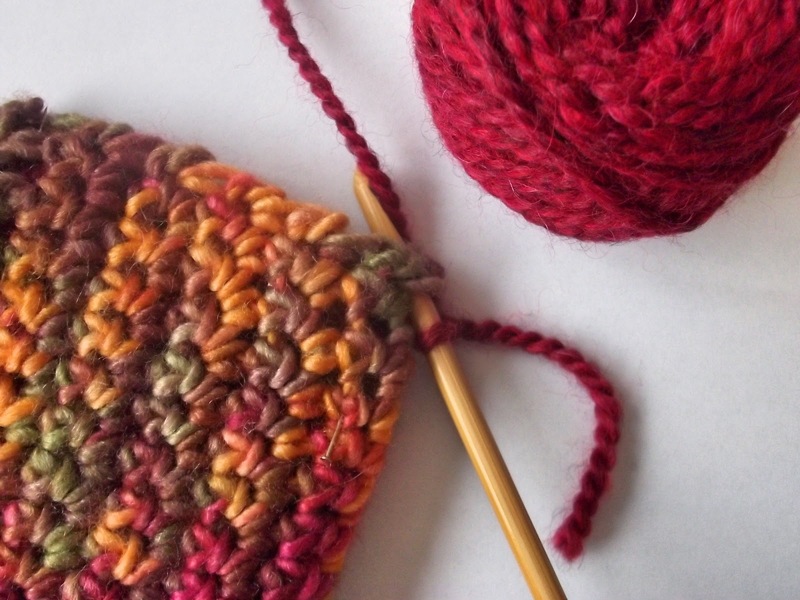 I found The Elegant Knitter at Goose Pond to be a good online source for the yarn. 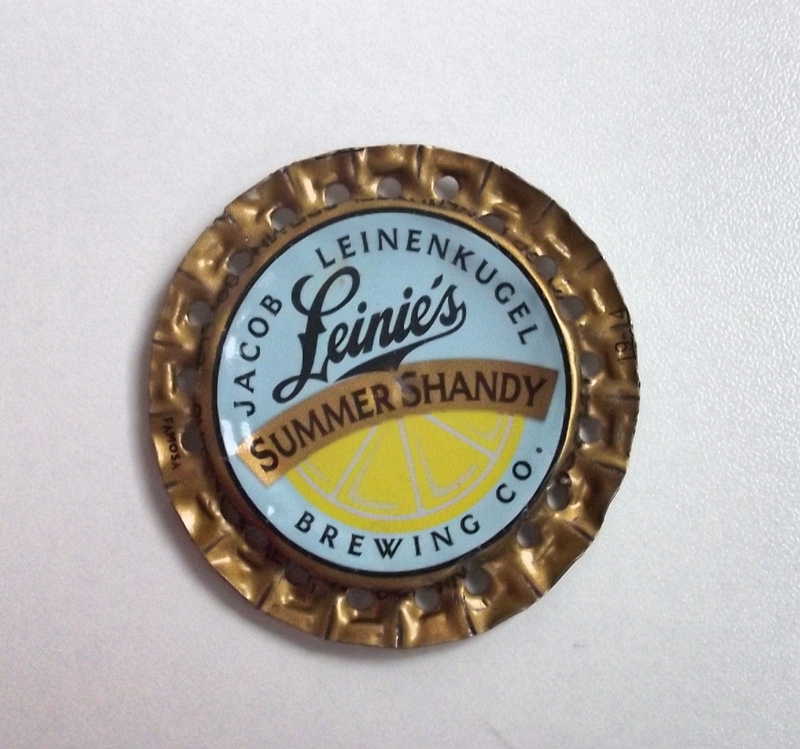 They carry it at a very reasonable price, ship promptly, and have great customer service. 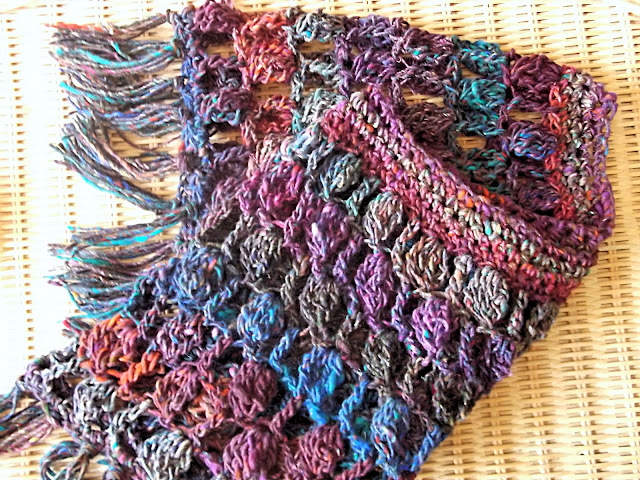 Both of these scarves/shawlettes are for sale at The Yellow Door Art Market, where I just moved my display to a bigger space, in order to accommodate more of my larger creations -- like scarves, shawls, and bags. I try really hard to be socially conscious in choosing what to buy. For good or for ill, money is a powerful influence in shaping our world. It's not always possible, but I try to think about the part my consumer choices play in that world-building process, no matter how minute. For example, I purchase my meat from a Michigan family farm, Creswick Farms, that utilizes sustainable and humane farming practices. I buy my milk from a local dairy farm, Calder Dairy, where the cows are humanely treated and do not receive hormones and antibiotics. I purchase Fair Trade certified coffee, tea, and chocolate because it is important to me that the people raising and processing these crops receive fair compensation and that the crops are grown in a manner that does not damage the environment. A few months ago, it came to my attention that perhaps I could also be more socially conscious in my fiber choices and have the opportunity to use some gorgeous and unique materials at the same time. 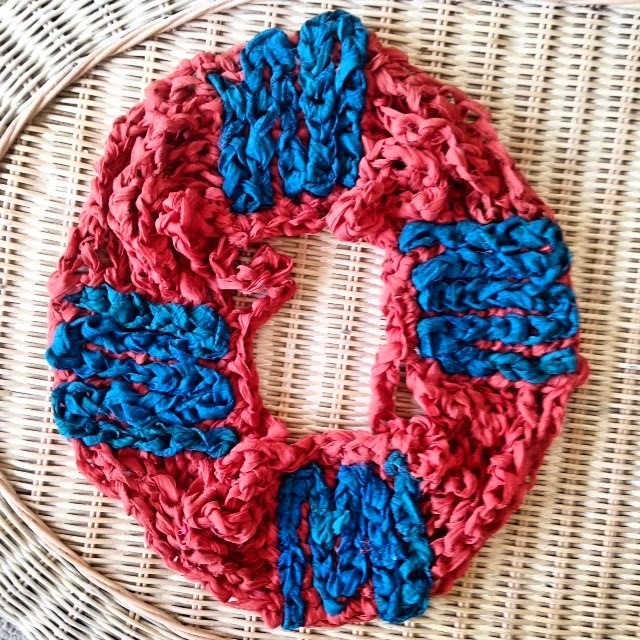 I learned about a yarn company called Darn Good Yarn run by Nicole Snow, a US Air Force Veteran. A fiber enthusiast, she started the company in 2008 with the goal of providing "phenomenal quality fibers to enthusiasts, while helping the women of Nepal and India become autonomous and self-reliant". 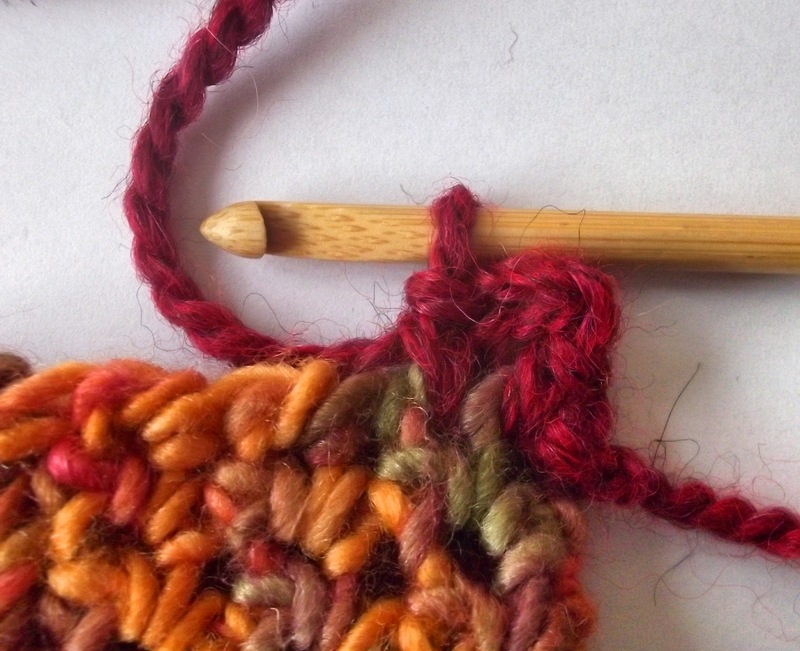 As their website explains, "[t]he women who work for [Darn Good Yarn] are hand-selected for their skill and given a wage that not only allows them to survive, but thrive. This affects the rest of their family as well. Their children can stay in school and get an education." 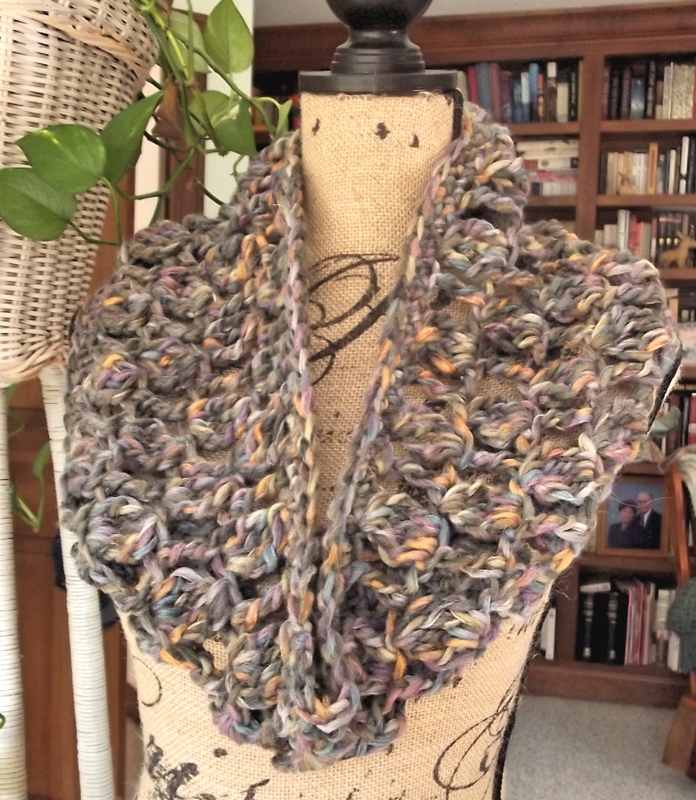 Another plus to purchasing fiber from Darn Good Yarn is that it is eco-friendly. Many of the fibers are recycled. 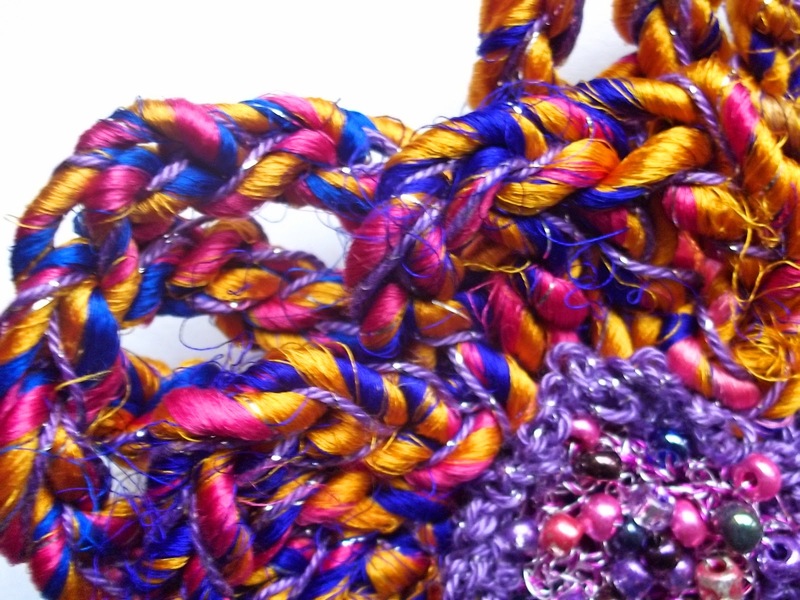 For example, the reclaimed and recycled sari silk ribbon yarn is made from sari silk fabric remnants collected during the trimming and truing portion of the manufacturing process. 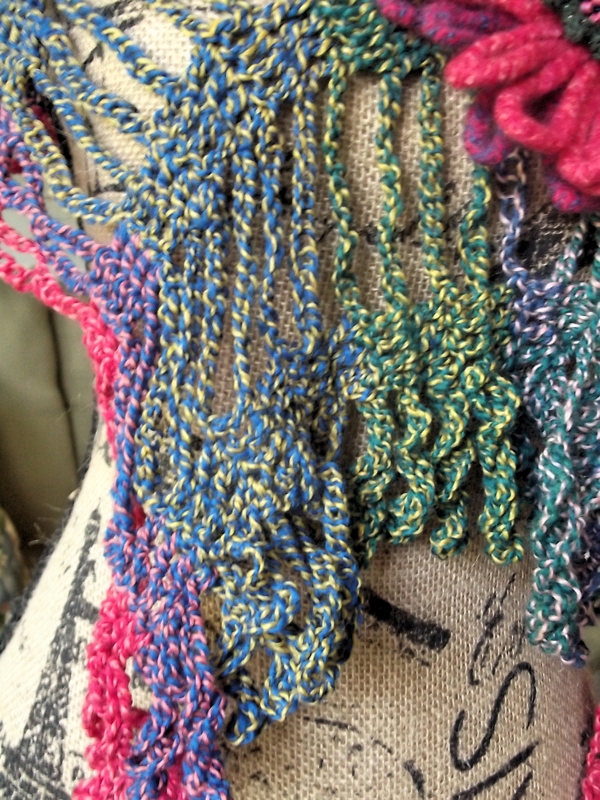 They also have very cool banana fiber yarn that is made from sustainable fibers scraped from the bark of banana trees. Some of the DGY yarns I have purchased but have not had the fun of working with ... yet. 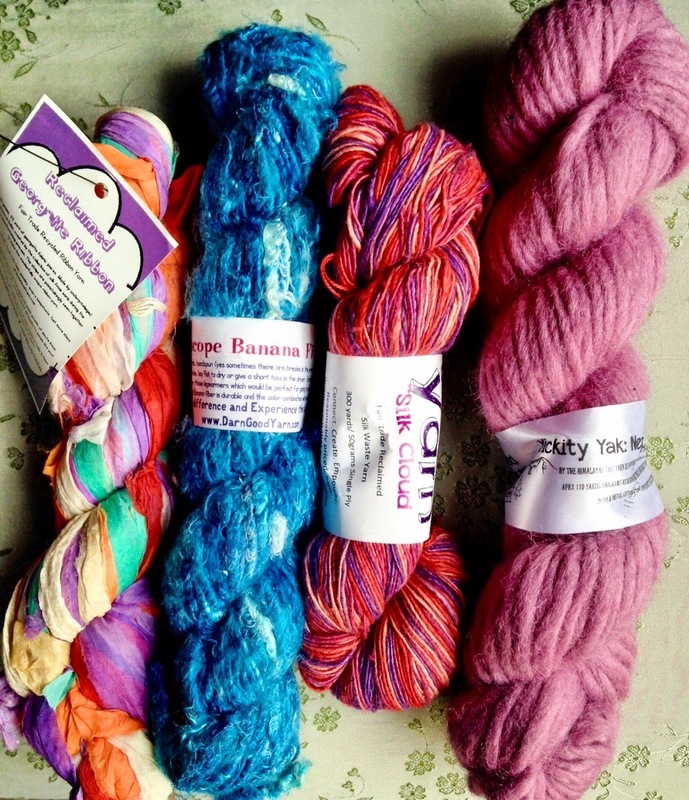 I purchased a couple of Darn Good Yarn yarns and I liked them so much, that I decided to sign up for their monthly yarn box subscription (which provides a surprise selection of fibers each month at a great price). I have to tell you, I LOVE this stuff! The colors and textures are just a lot of fun to experiment and work with, and the finished pieces are truly unique. 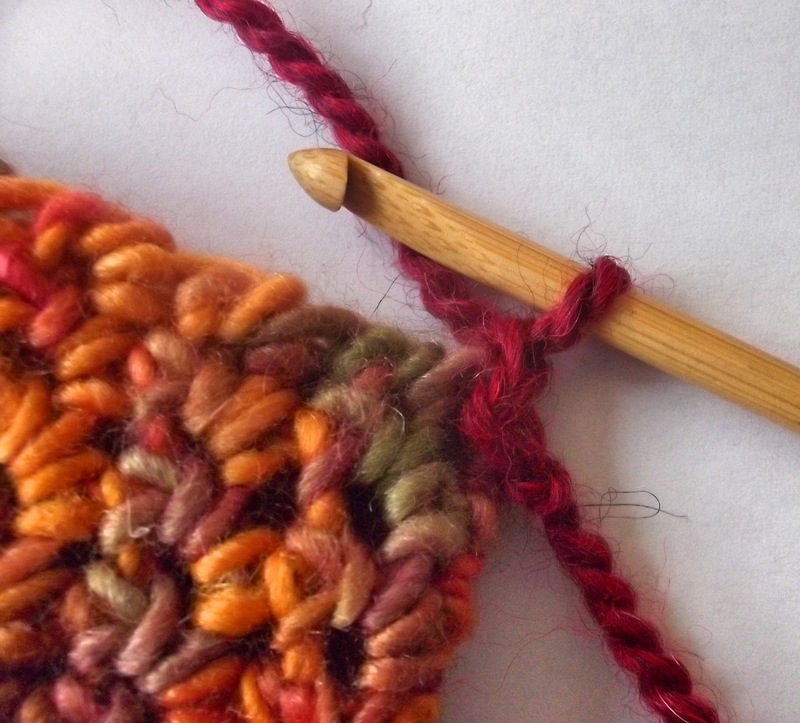 It is not fiber for the timid, or those who are going for a really smooth, polished look in their finished work. 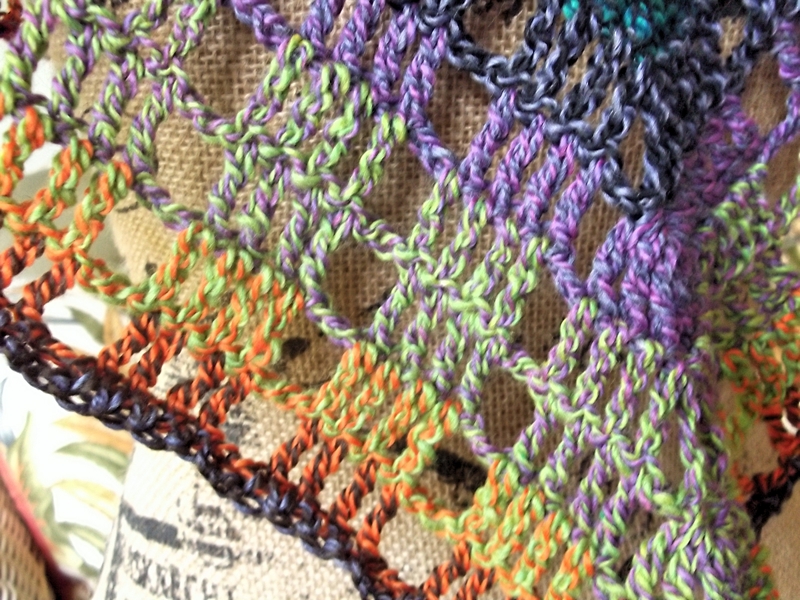 If, however, you are ready to try something bold and different, and you enjoy creating pieces that are just a bit more primitive and textural, you will take great delight in what Darn Good Yarn has to offer. 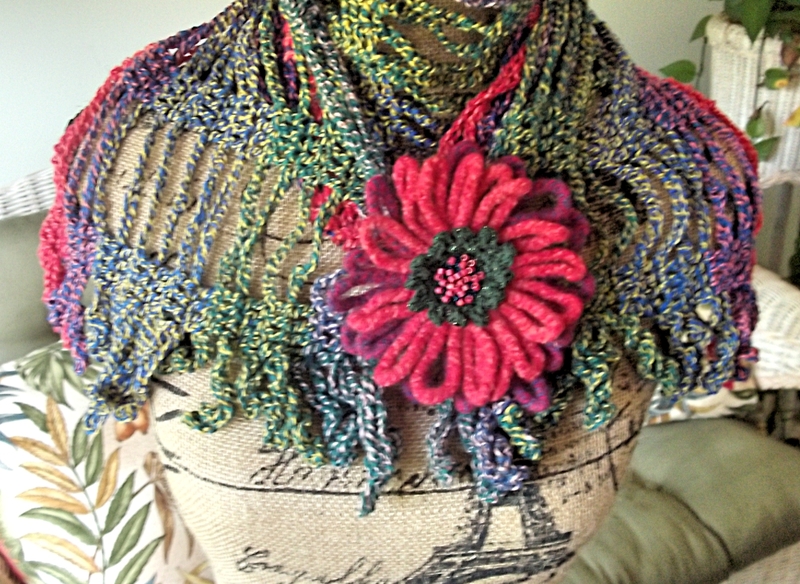 Here are some photos of some of the pieces I've crocheted using Darn Good Yarn fibers. 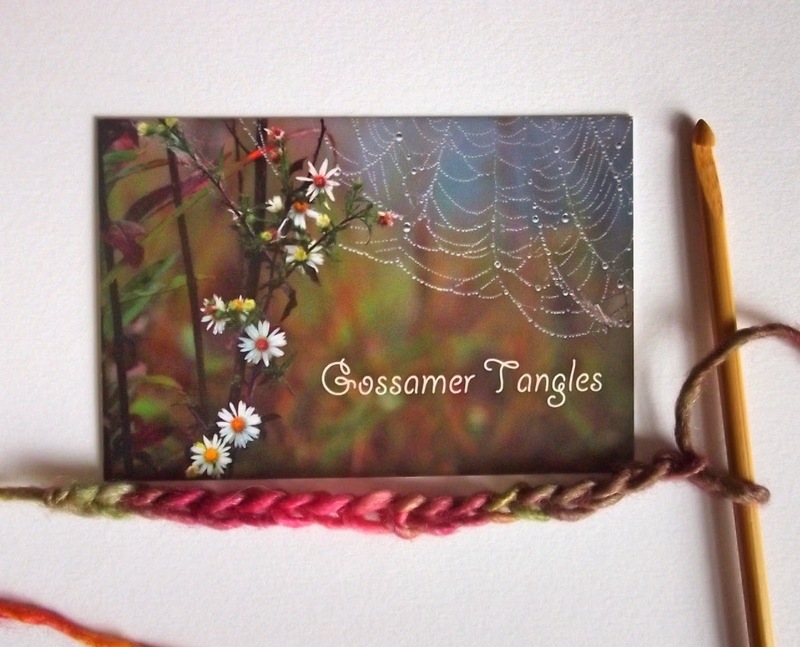 I wish I had taken photos of a few of the others before I placed them in shops, At least these will give you an idea of some of the endless possibilities for creating with this stuff! 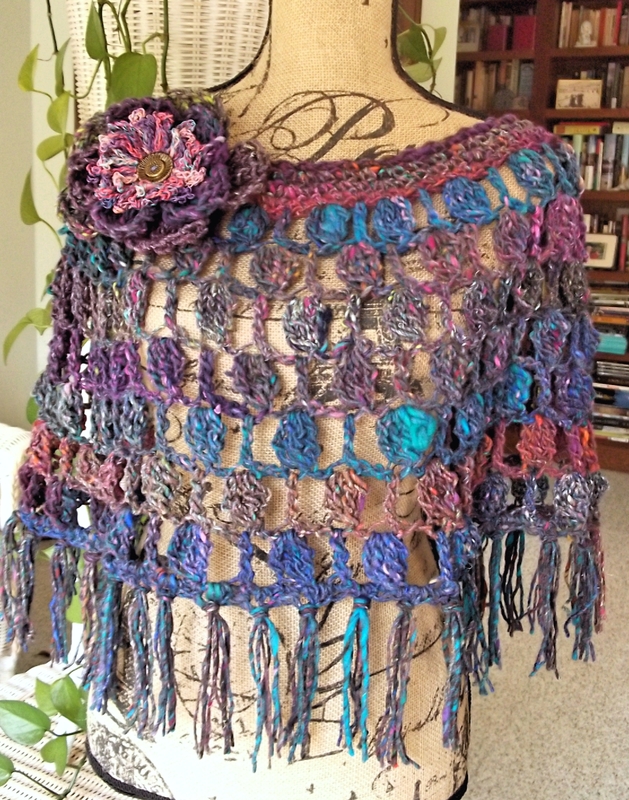 A cowl I crocheted using DGY recycled silk chiffon ribbon yarn. 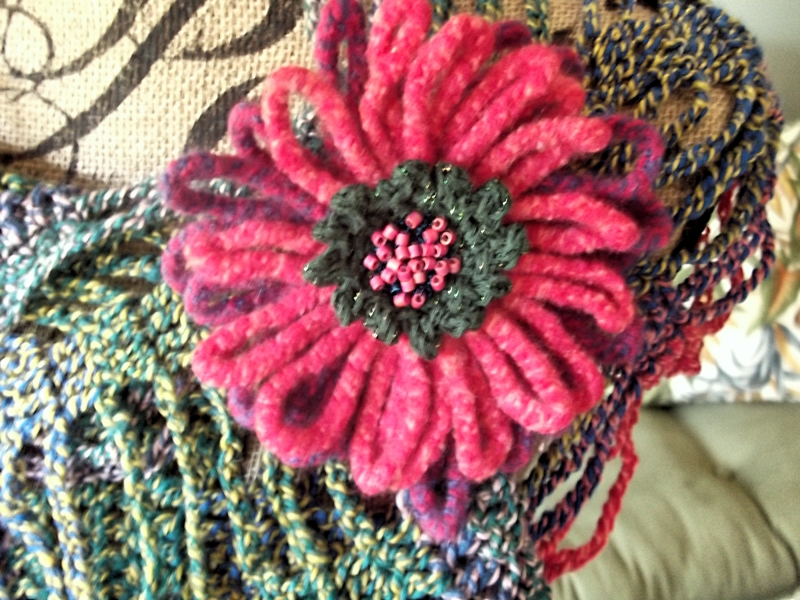 A flower I crocheted using recycled "firecracker" sari silk from DGY combined with crochet cotton. 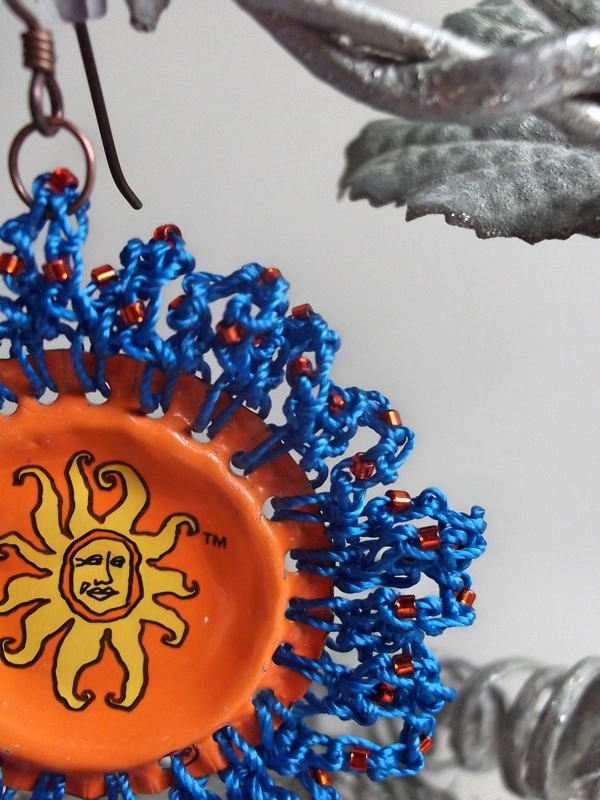 Center is crocheted wire and beads. 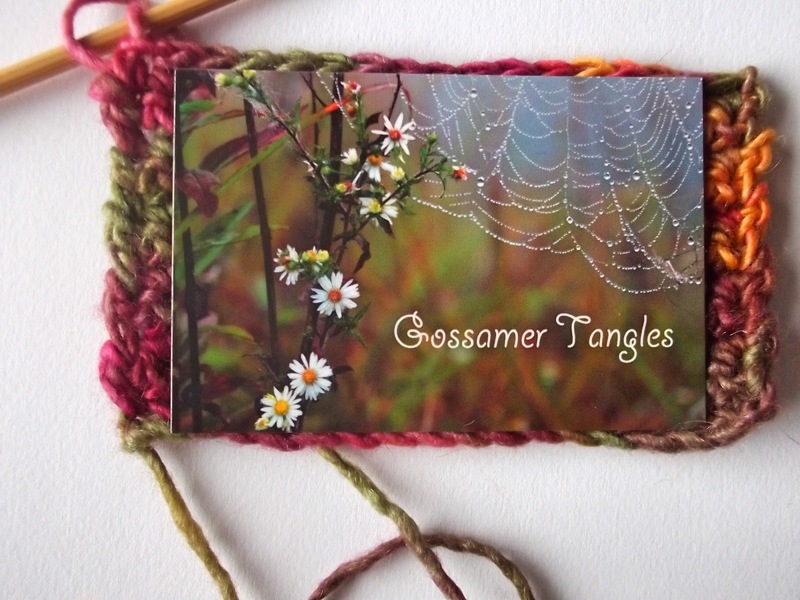 Just in case you are wondering, Darn Good Yarn was not aware that I was creating this post, and I did not receive incentives or compensation of any kind from them to create this post or use their products. I just really like their fiber and I love what they do, so I wanted to let you know about them. 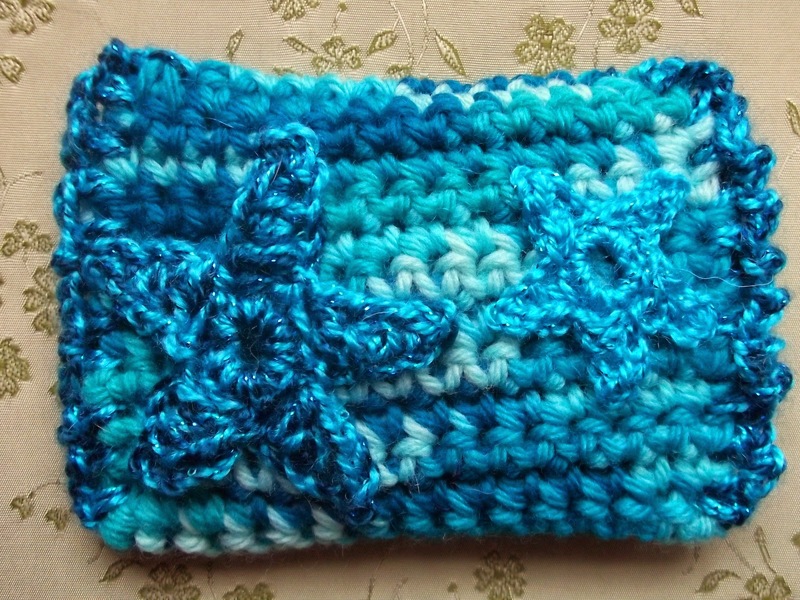 PS: Later on the same day I made this post, I finished another piece crocheted from a "non-traditional" fiber. 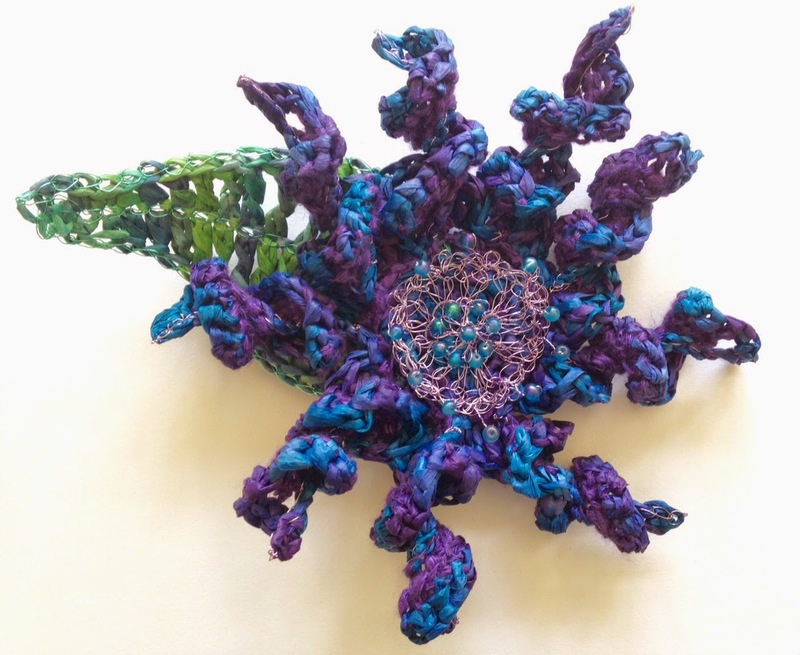 This flower brooch uses Premier Yarn's Raffia (made of 100% Cellulose Rayon). It has a straw-like, papery texture, but seems quite strong. 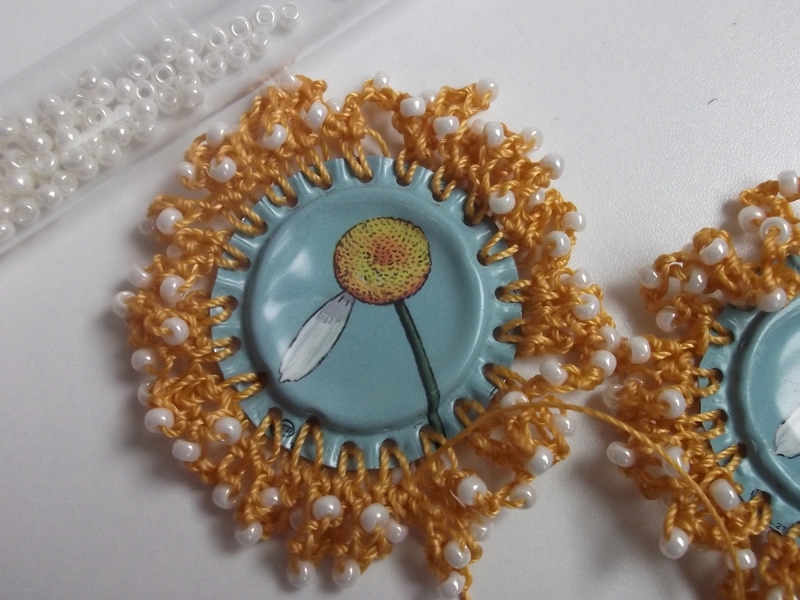 Because of the larger size of this flower (about 5 inches across), I added some wire crochet to give the flower more structure -- make it less floppy. 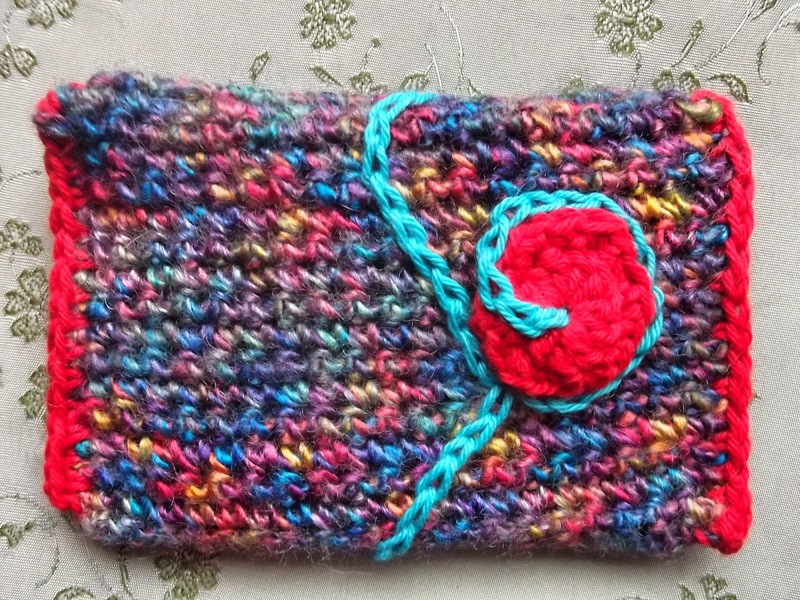 For Valentine's Day this year, I designed an easy-to-make, little crocheted card wallet. 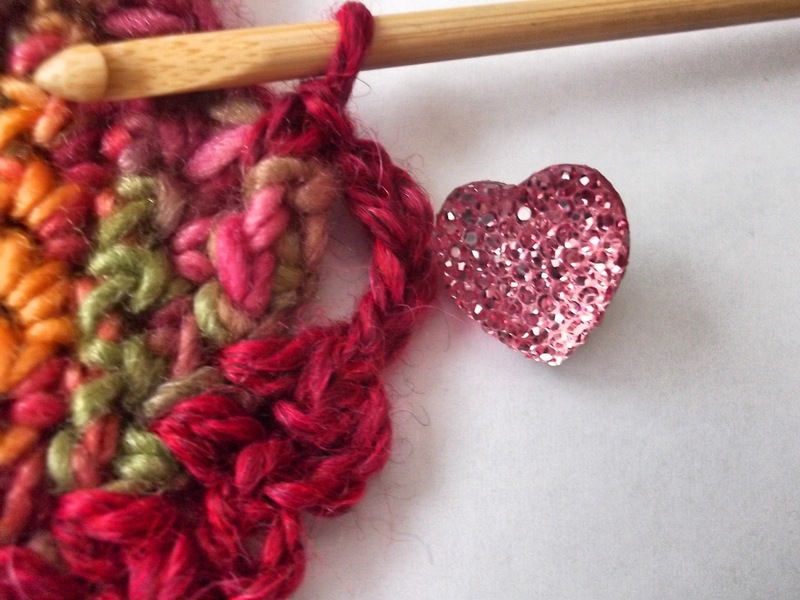 I thought I would use today's post to share a tutorial on how to make one. 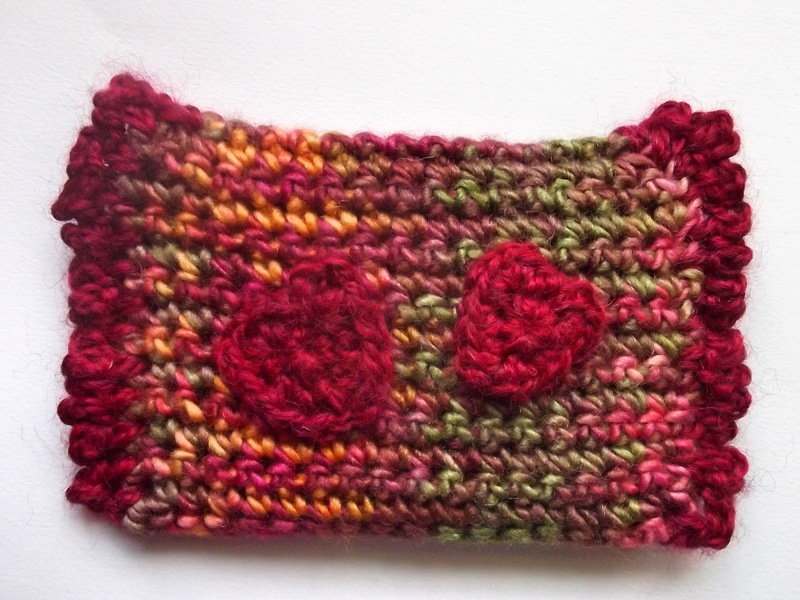 While the tutorial shows a heart-themed wallet, as you will see from the photos at the end of this post, you can use this basic concept to create a variety of designs. 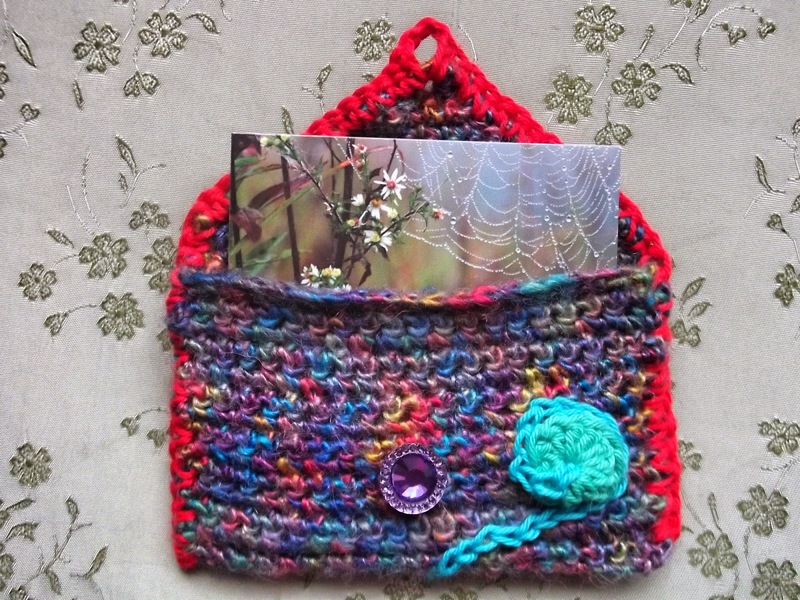 Rather than give you a specific stitch-by-stitch pattern, I'm going to give you general instructions that will allow you to easily crochet a card wallet using almost any type of yarn that you have on hand. Let me just say that I really love card wallets! They are so versatile and just about any female you know, from elementary age to seniors, can use one. 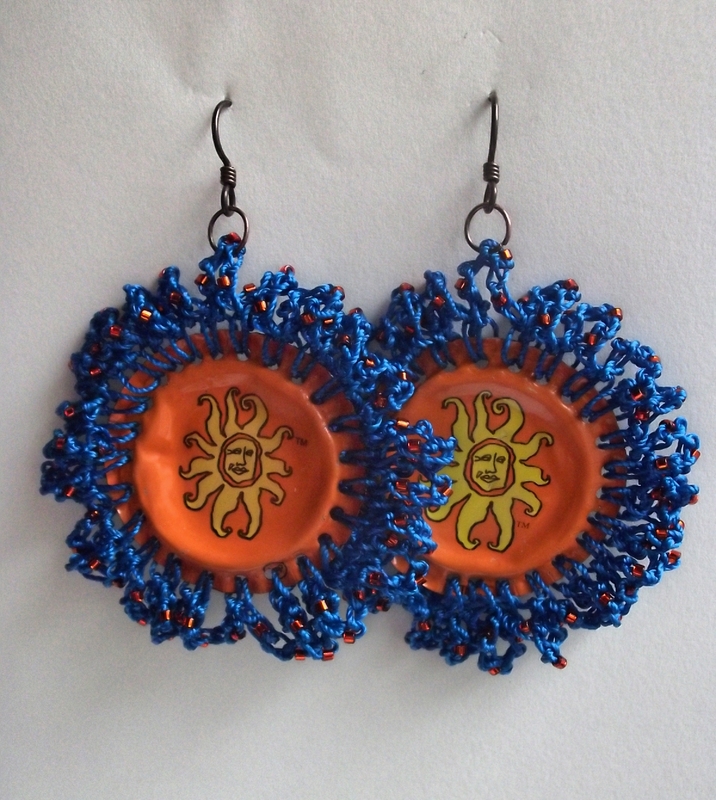 Initially, they are fun to give because they can be worked up to suit the personality of the person you are gifting (favorite colors, embellishments, etc. ), and you can tuck a gift card for their favorite shop or restaurant inside, or even just a little card with an expression of love or personal message for the recipient. The card wallet can then be used to hold business cards, credit cards, identification, or can be used as a little change purse. You could even stow keys or a chapstick/lipstick inside. It fits handily in a pocket or your purse. 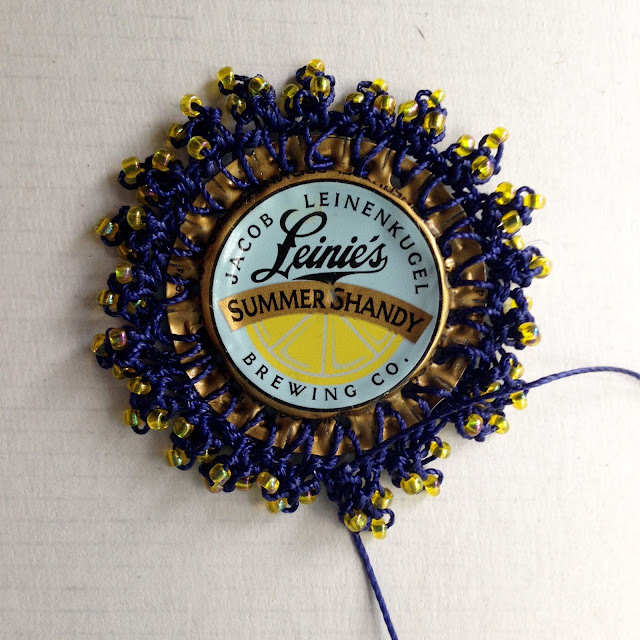 Step 1: Using a credit card or business card as a guide, crochet a chain that is just slightly longer than the card (about 1 chain stitch larger on each side). The chain should be an odd number of stitches. 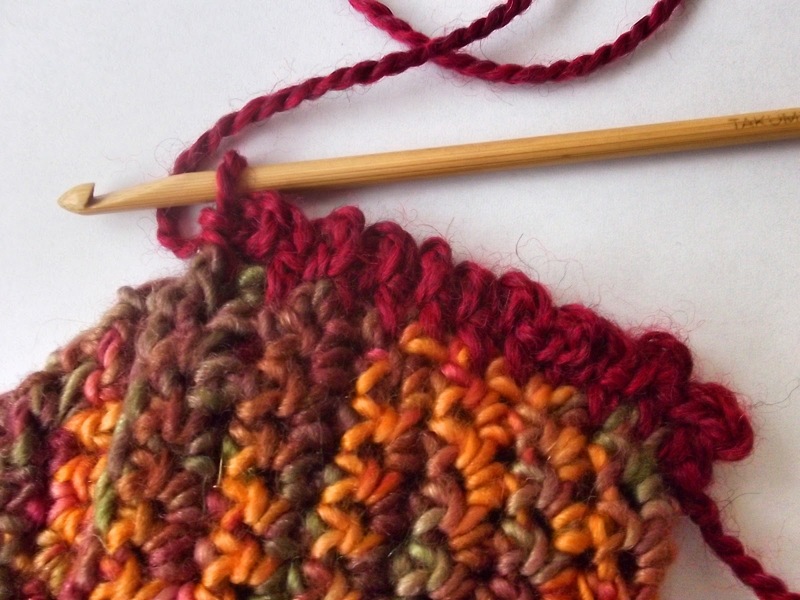 Then crochet 1 stitch more. In the photo above, my chain was 17 stitches and I added one more to make 18 total. Step 3: Turn, ch 1, sc in each sc across to the end. (Again, 17 sc for me in the tutorial example). 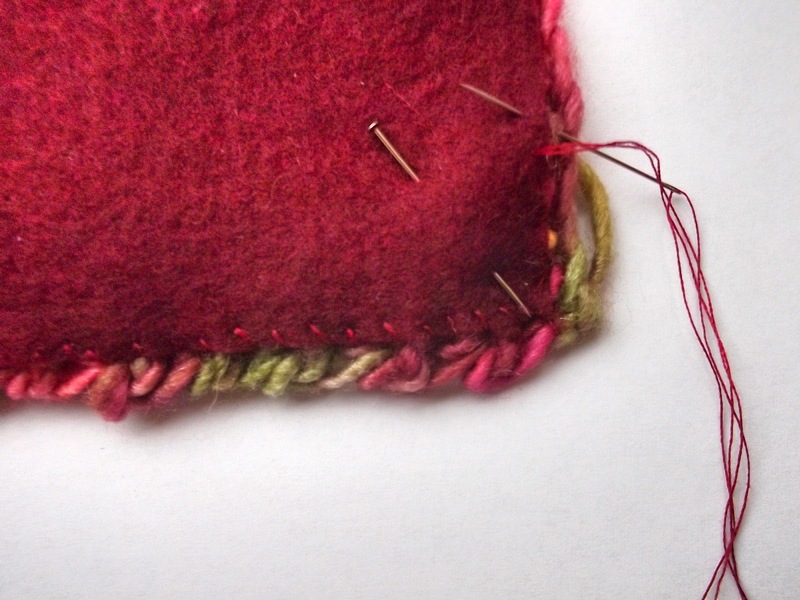 Continue in this manner (turn, ch 1, sc in each stitch across), making rows of sc stitches, until your piece is the same height as the card you are using for a guide. Count the number of rows you have completed. (In the tutorial example, it was 11). Step 5: At this point, you are going to be decreasing the number of stitches in each row, on both sides, to create the fold-over, envelope flap for the wallet. So, you will turn, ch1, sc2tog (over the first 2 sc in the previous row), sc in each sc across until you reach the last 2 sc, then sc2tog over those last 2 sc. 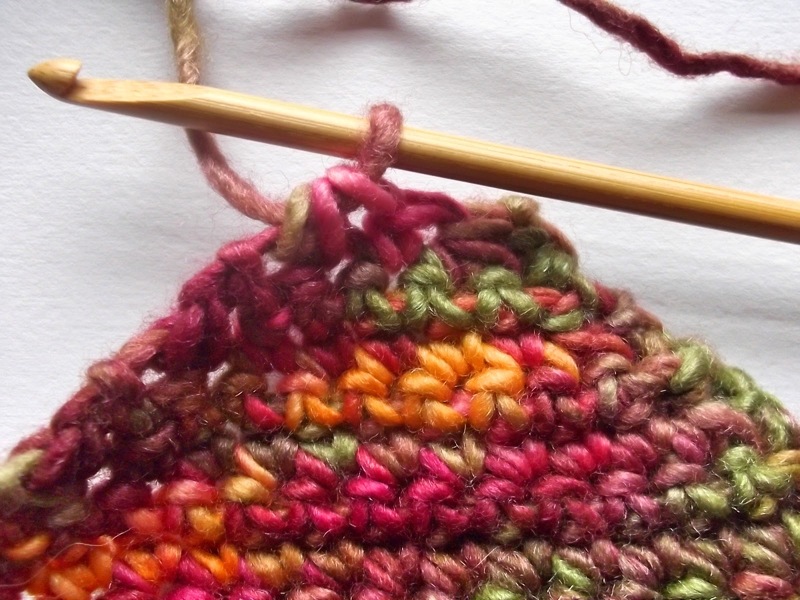 (You thereby decreased the number of stitches in your row by two. 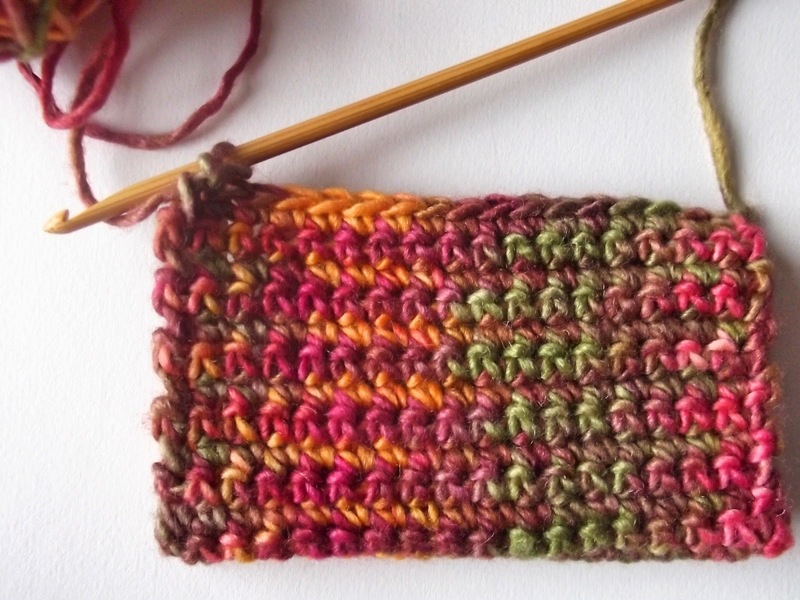 For me, in the tutorial example, that was a decrease from 17 stitches across to 15 stitches across.) Continue row by row in this same manner (sc2tog at each end of the row, thereby decreasing the row stitch count by two) until you have three stitches in your row (sc2tog, sc, sc2tog) (last Step 5 photo above). Step 6: Turn, ch 1, sc3tog. 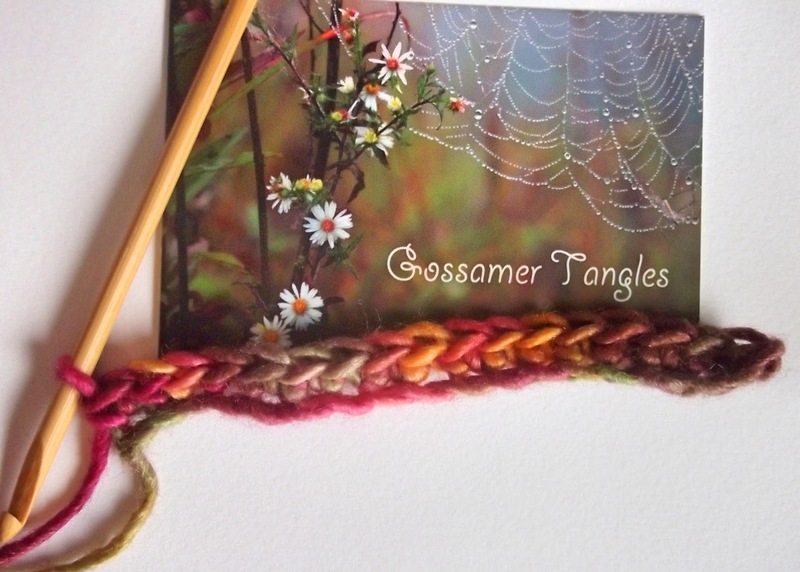 (You will be pulling up a loop in each of the three remaining stitches from the previous row, so you have 4 loops on your hook, then yarn over and pull through all 4 loops, bringing the envelope flap to a point.) Fasten off. 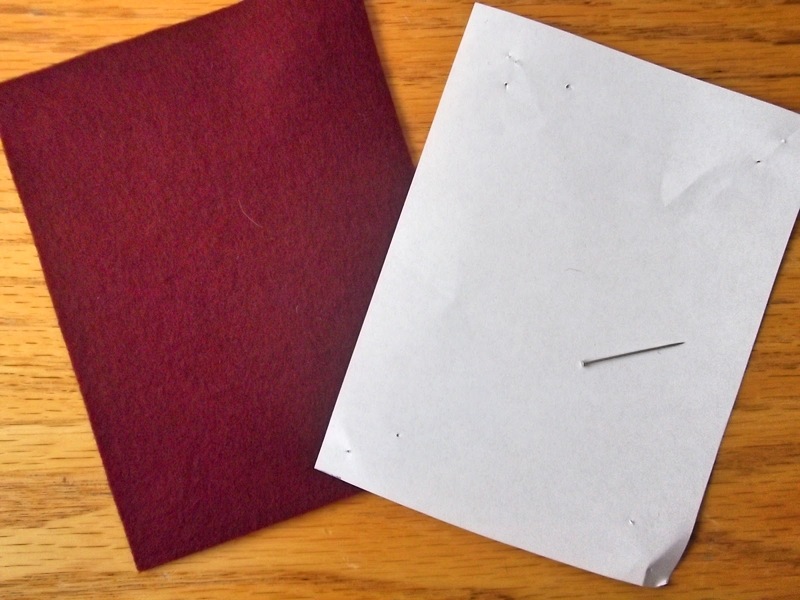 Step 7: Making the lining - Get out your felt, sheet of paper, pencil, ruler and/or tape measure, and straight pins. 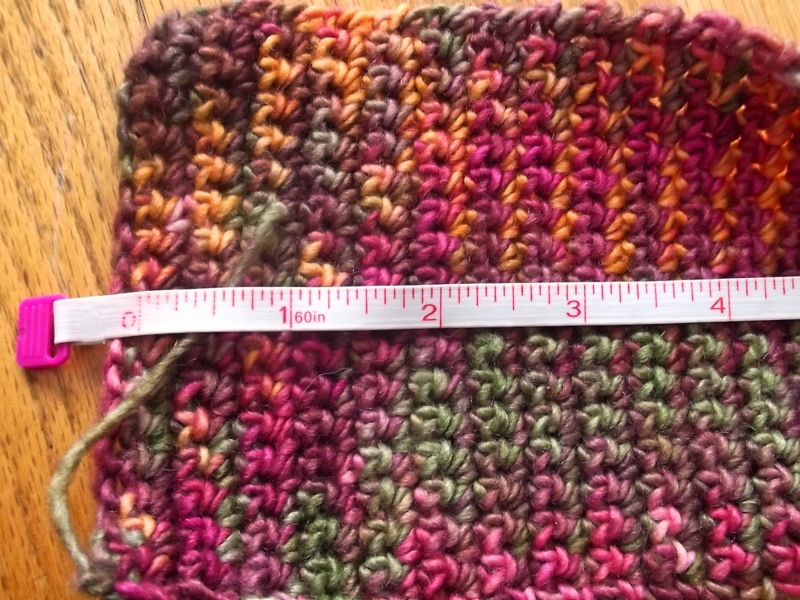 (a) Measure the rectangular portion of your crocheted piece - length and width (for length measurement, start one row below the first row of the decrease on the flap and measure to about 1/8 inch shy of the bottom edge of the foundation chain; for width measurement, leave a small border on each edge). (My measurement for the tutorial wallet was approximately 4 3/4 inches by 3 1/2 inches.) 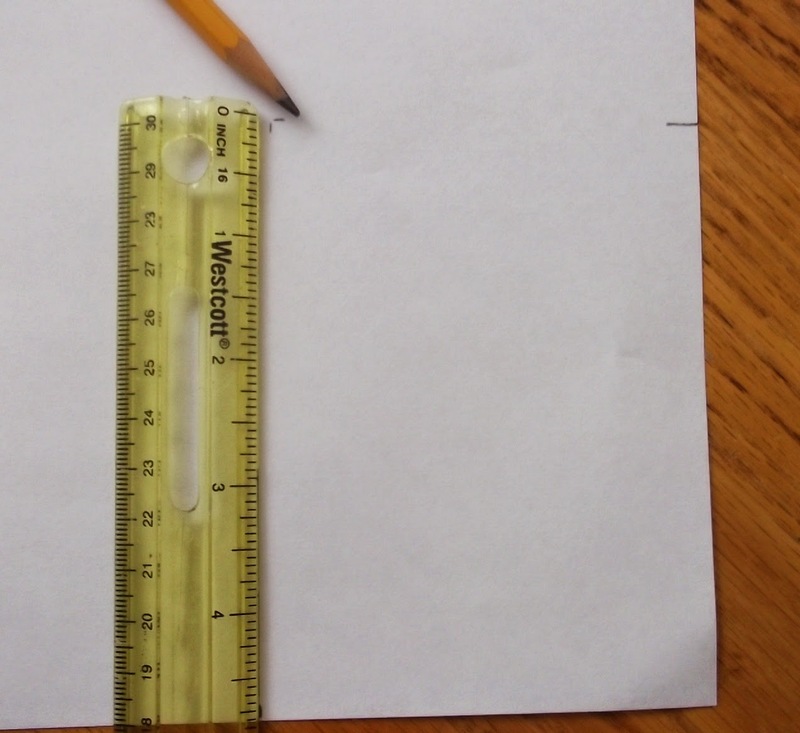 (b) Using your measurements, create a rectangular paper pattern for your lining. 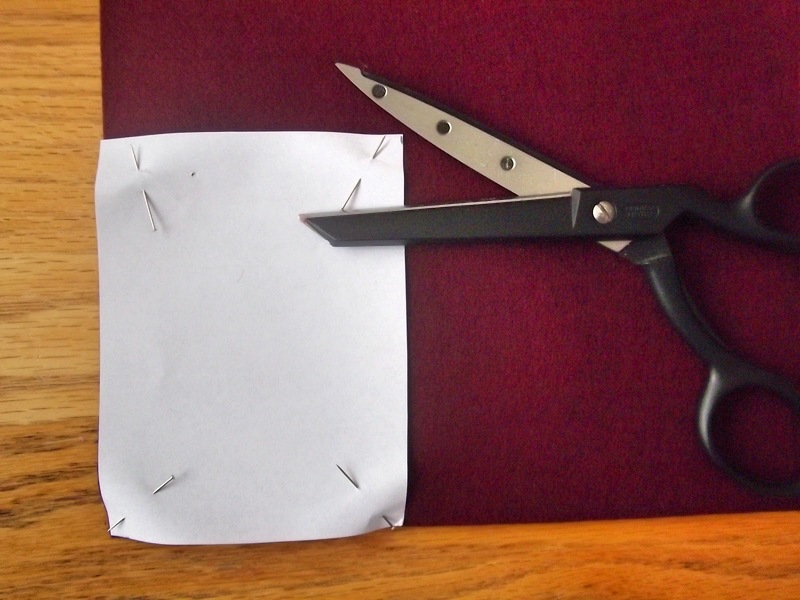 (c) Pin the pattern to your felt and cut it out. 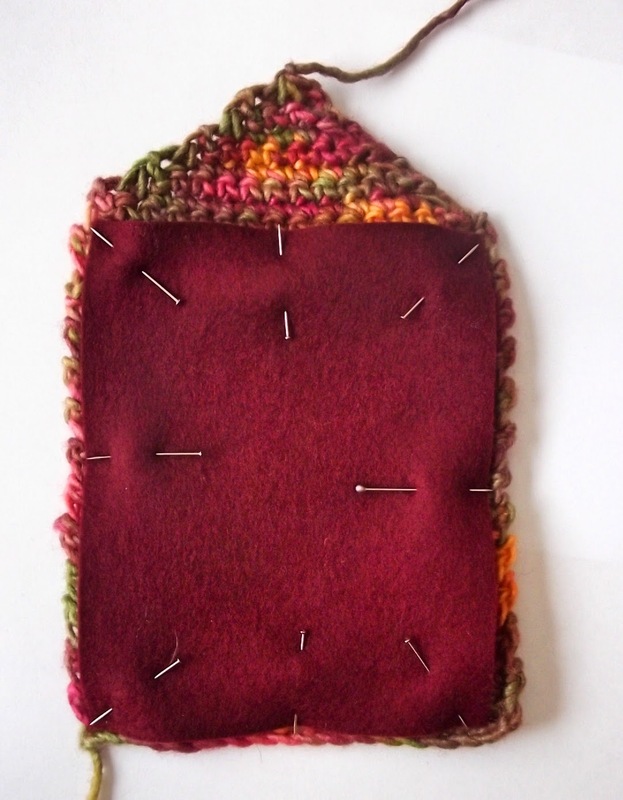 (d) Then, take the resulting felt lining and pin it to the wrong side of the rectangular portion of your crocheted card wallet body. Step 9: Fold the card wallet by bringing the bottom edge up to just below the triangular, envelope flap. The felt lining should now be on the inside of the wallet. 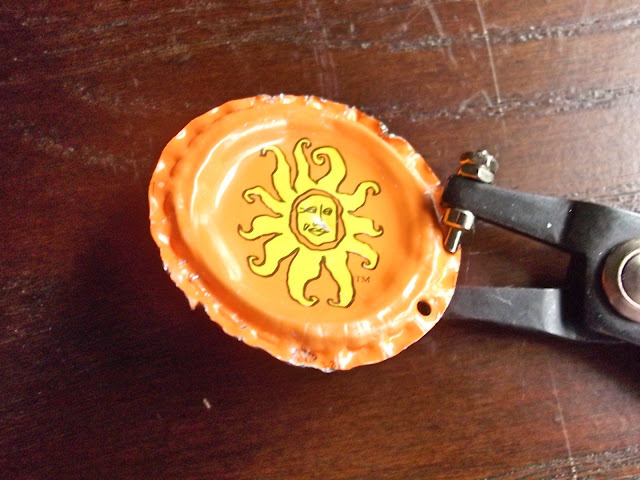 Pin the edges in place. Step 10: Side seams and edging - Join the yarn you've chosen for your side seams and edging to a bottom corner of the wallet, at the fold. 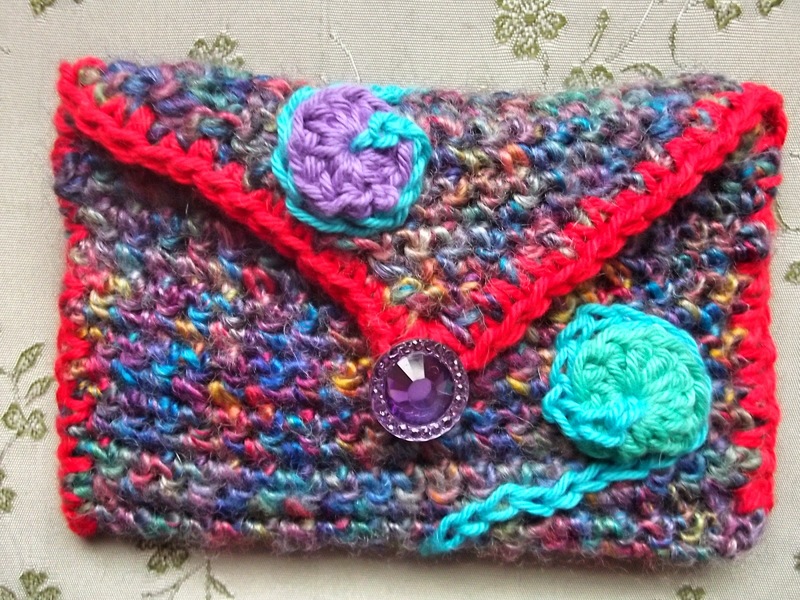 Be sure to go through both sides of the wallet (you are creating the side seam). 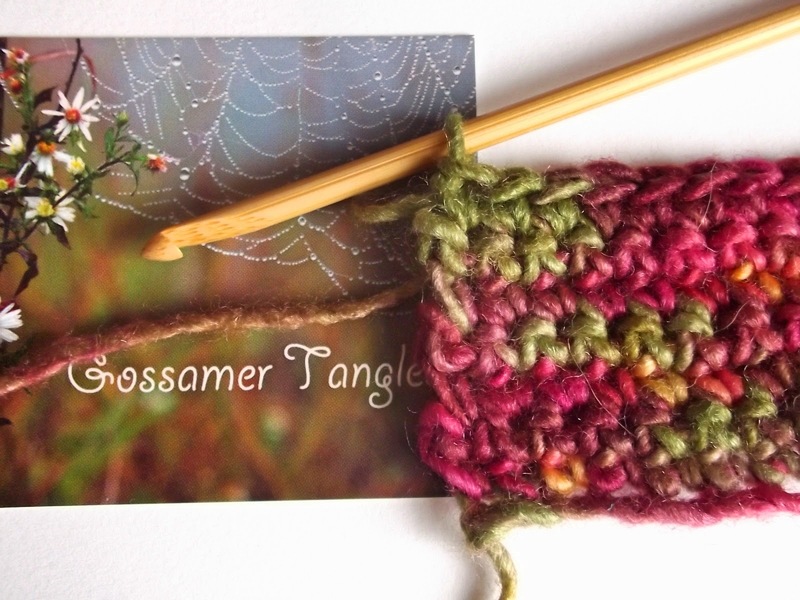 (My seam/edging yarn was a worsted weight, a bit heavier than what I used for the body of the card wallet, and so I switched to a size G hook.) (a) Chain 1. (b) Sc in the same space as joining, ch 3, then, working up the side, sc in the end of the next row, again going through both sides of the wallet (front and back) with your sc, ch3, sc at the end of the next row. (c) Continue in this manner working your way up the side to the point where the front of the wallet body ends and the flap begins. 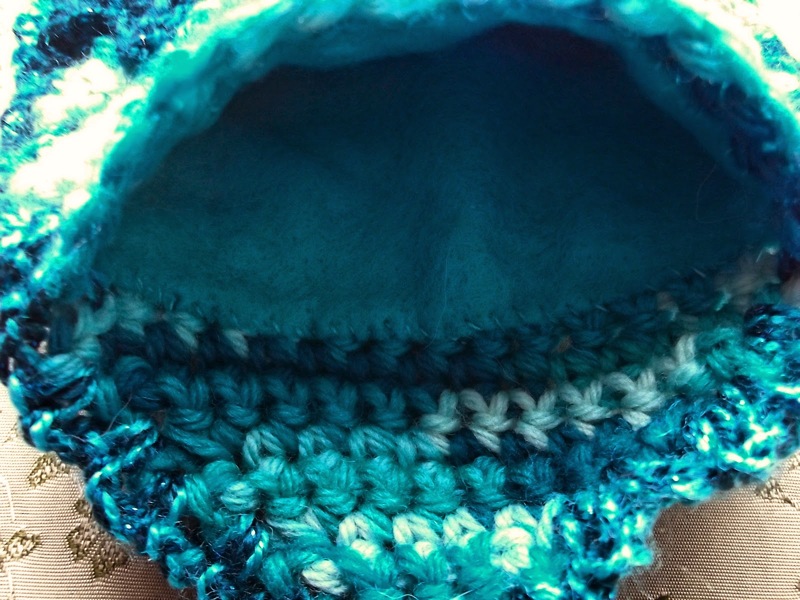 Note that you are creating the side seam and the decorative edging at the same time (easy and a time-saver!). Step 11: Flap edging - (a) Continue as in Step 10, beyond the side seam and around the edge of the flap. 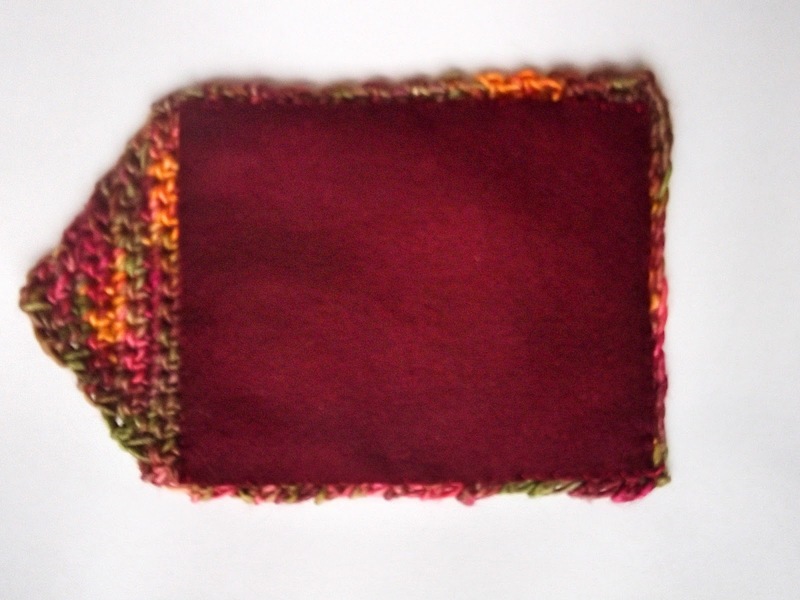 Placing a sc in the end of the first row of the wallet flap, ch 3, sc in the next row end, ch 3; continue in this way along the edge. (b) When you come to the point of the flap, lay the button you've chosen to close the wallet next to the wallet and determine the size loop you will need to go around it. Chain an adequate number to make a loop that will fit the button, and then anchor the button loop with a sc on the other side of the point. 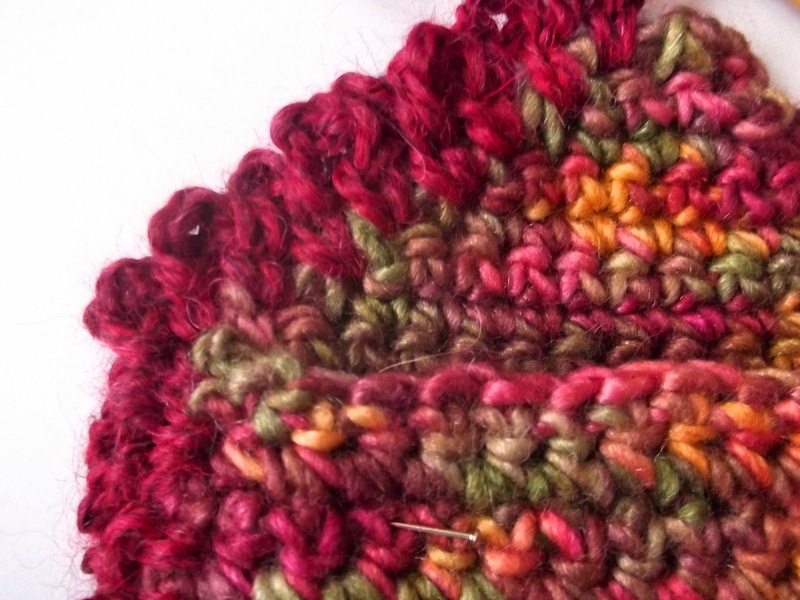 Continue with the pattern of sc and ch3 along the opposite side of the flap. Step 12: Remaining side seam/edging - when you reach the point where the flap meets the front upper edge of the wallet body, resume creating the side seam/edging along this remaining side, just as you did in Step 10. 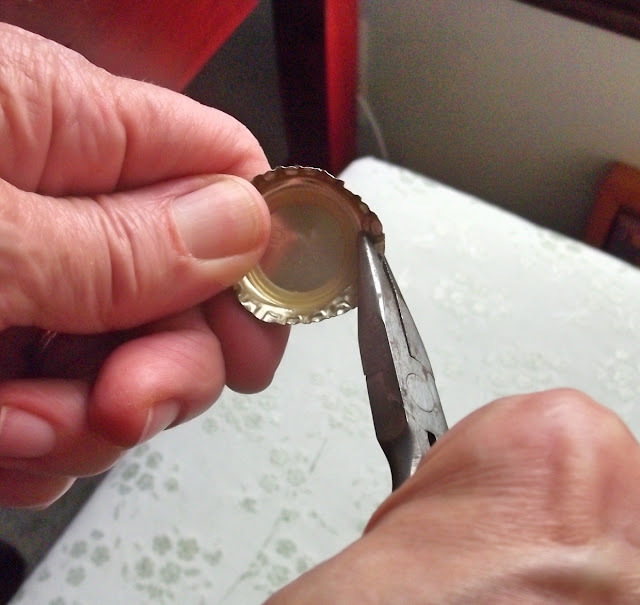 When you reach the bottom fold, place your last sc in the last row/bottom corner and fasten off. 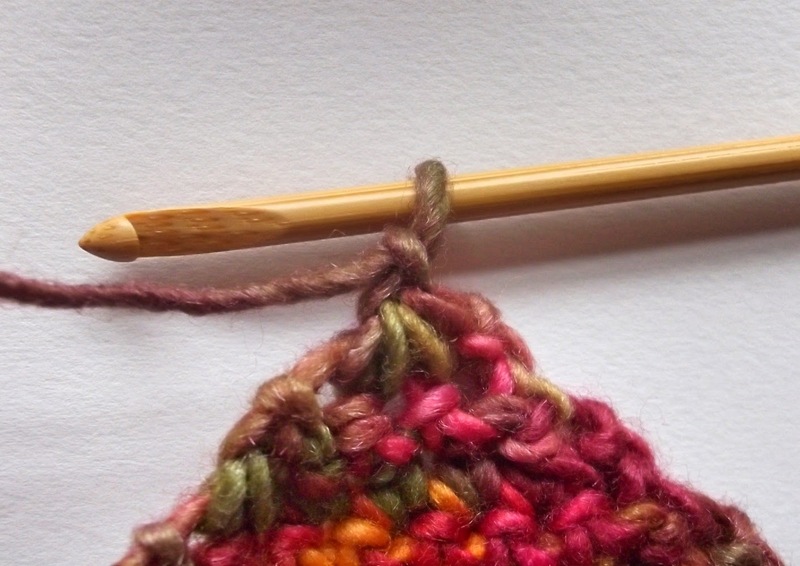 Step 13: Using your yarn needle, work in all of your yarn ends. Step 14: Add your embellishments - Now it's time to make your card wallet one-of-a-kind by adding your choice of embellishments. 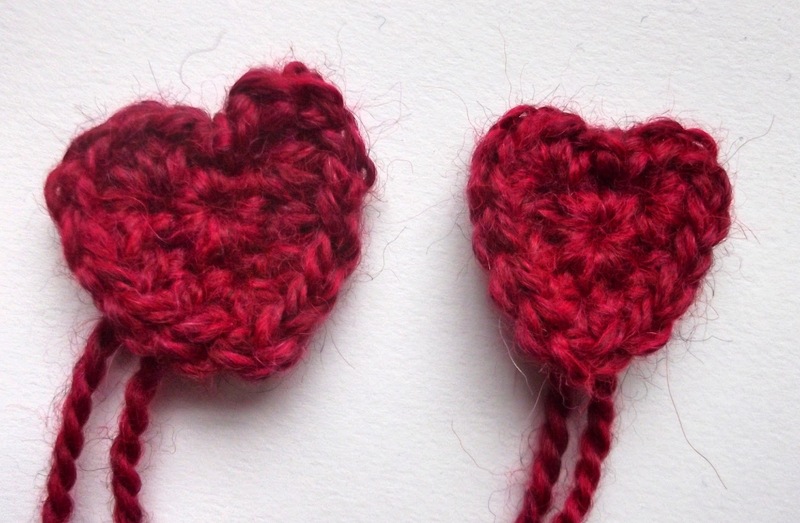 For this particular design, I crocheted 2 small hearts, one a bit larger than the other, using the same yarn I used for my seams and edging. 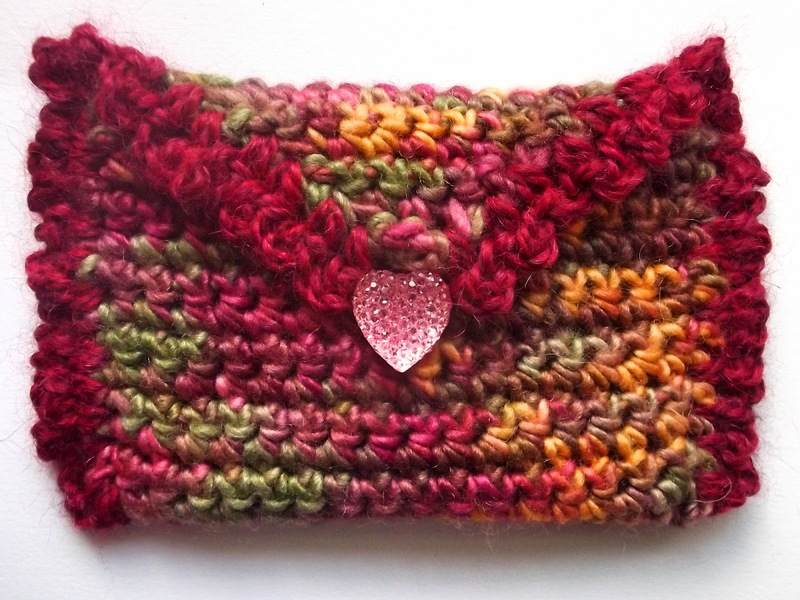 I used Julie Kundhi's easy and adorable tiny crochet heart pattern. 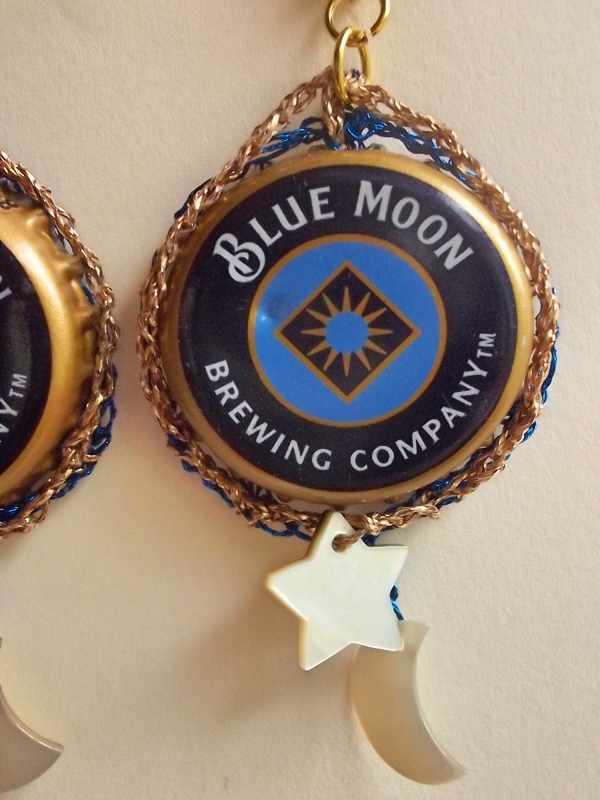 You can add whatever decorative touches you wish to make your wallet unique! Step 15: Determine your button placement. Sew it on, and you're done! 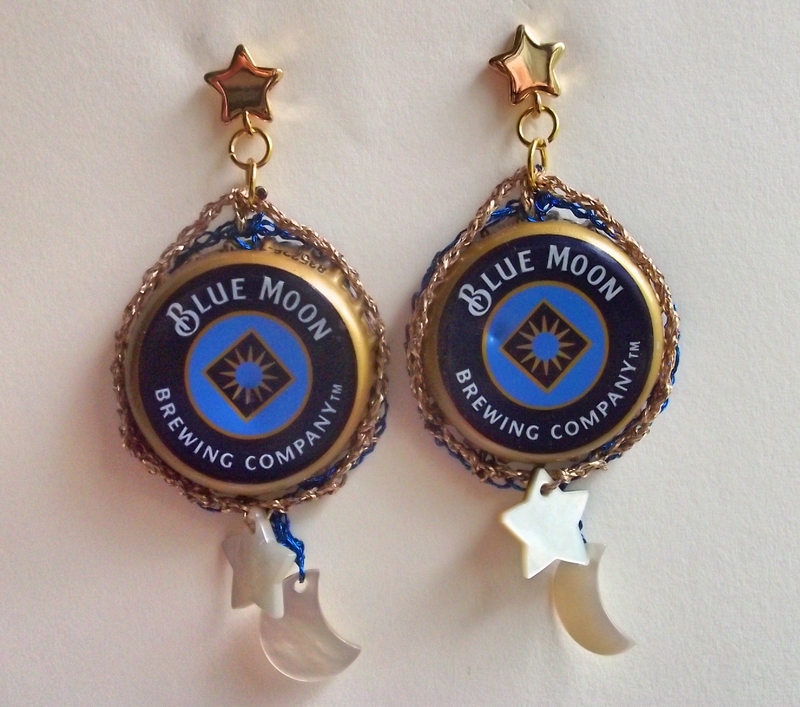 You have a fabulous little gift for someone special (or a fun little treat for yourself). 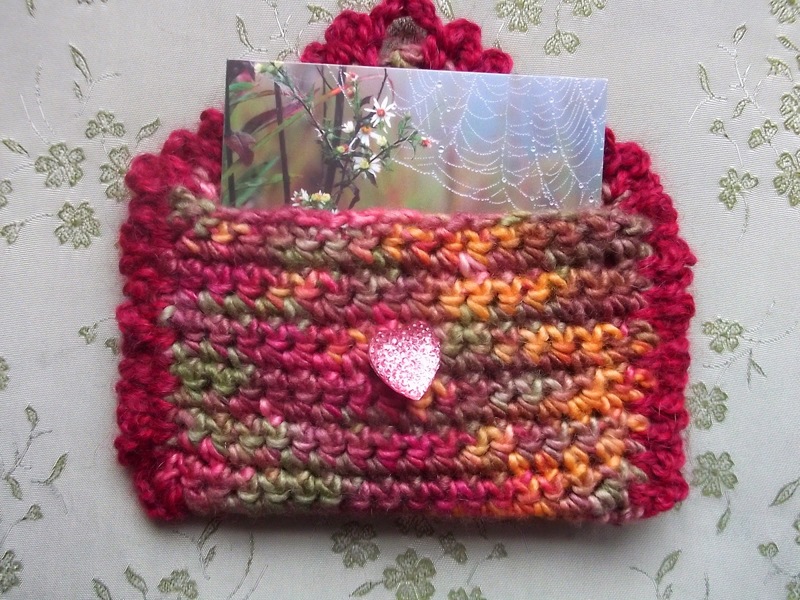 This second wallet was crocheted using Cascade Yarns 220 Paints (a yarn which, as far as I can determine, has been discontinued). For the seams and edging, I used a double strand of two shades of metallic Bonbons. 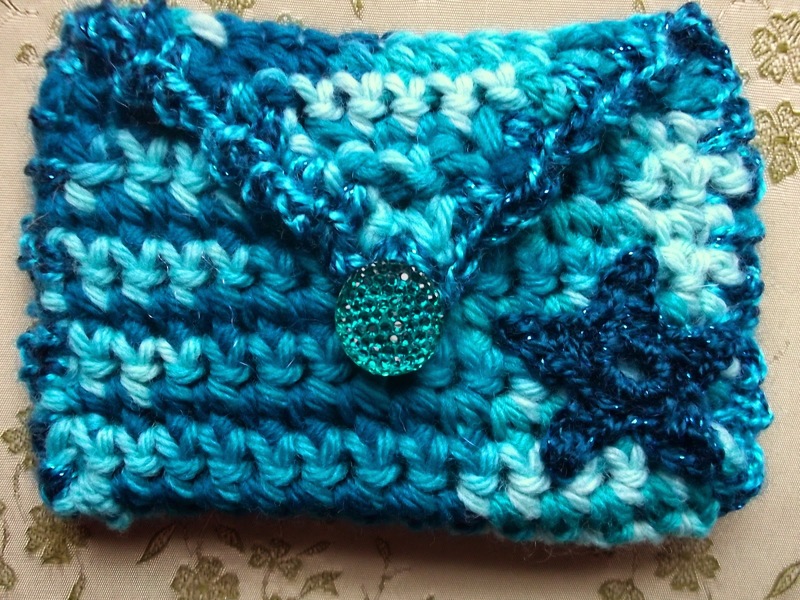 I crocheted stars in different sizes -- one larger one using the same double strand I used for the seams/edging, and then two smaller ones using each of the seams/edging colors separately, as a single strand. Combine the instructions in this tutorial with your own creative imaginings and see what you come up with! Have fun!